2019 San Francisco Regional Champions! As part of an eventful weekend, we attended the 2019 San Francisco Regional, in San Jose, CA. We had a great time at our first tournament of the FIRST Destination: Deep Space Season with our robot, Backlash. We won the Innovation In Control Award sponsored by Rockwell Automation for our code. Alongside FRC Team 971 Spartan Robotics and FRC Team 5700 SOTA Cyberdragons, we were able to win the tournament, earning another Blue Banner! Throughout our qualification matches, we executed a strategy in which our goals were to fill one full rocket for a ranking point and to climb to level 3 of the HAB zone at the end of every match. We encountered consistent defense from most opposing alliances, resulting in our failure to fill in a rocket in a few matches. 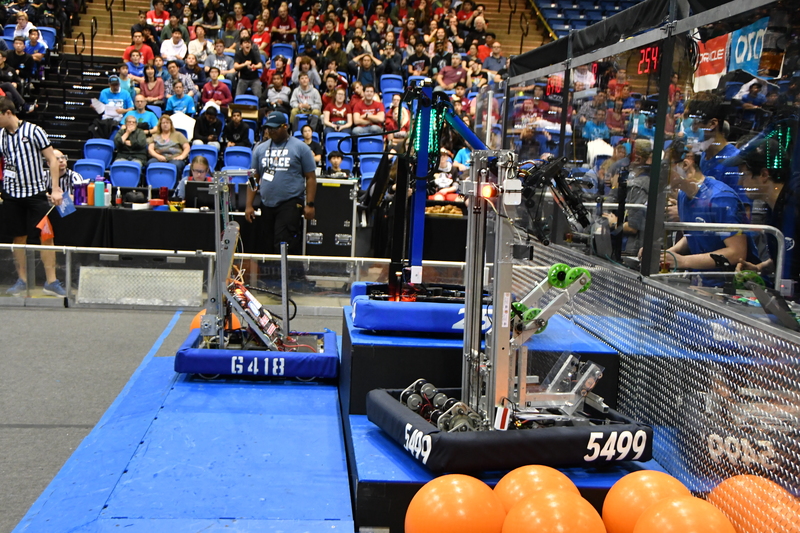 We also tried to maximize scoring cargo balls since it was the tiebreaker metric when it came to matches in which each alliance earned the same number of ranking points. We also maximized the amount of cargo balls scored during qualification matches since cargo balls are worth more in point value than hatch disks. We ended up with a record of 10-1-1 during the qualification match period. 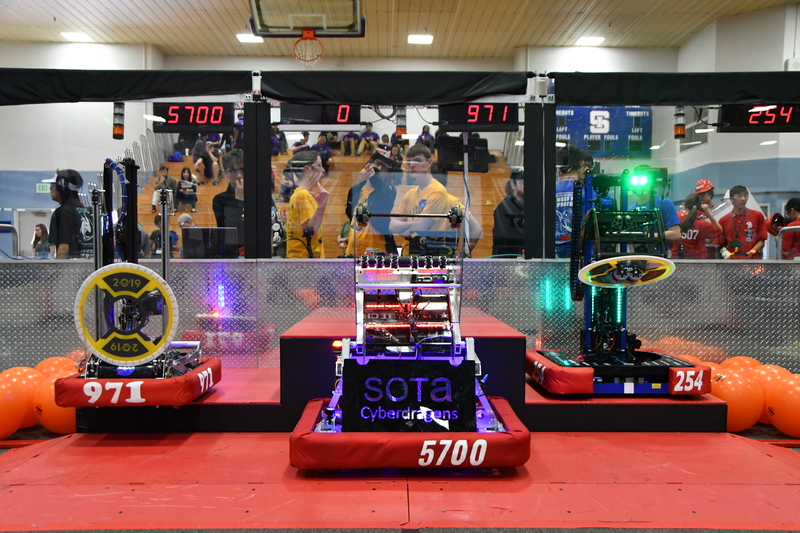 Going into the elimination period, we were excited to join an alliance with FRC Team 971 Spartan Robotics and FRC Team 5700 SOTA Cyberdragons. Our main goal was to draw defense away from Team 971’s robot, allowing Team 971 to focus on scoring cargo balls. 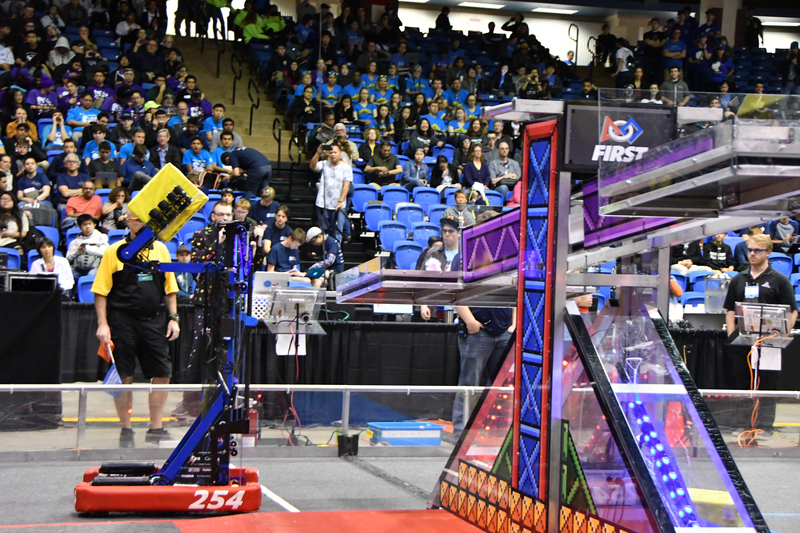 This strategy gave us the opportunity to score more points, since filling up the rocket did not give our alliance an advantage during the elimination period. Though we focused on distracting defense from the opposing alliance, we scored a few hatches for extra points. By scoring hatches on the rocket, we also opened up more options for Team 971 to score cargo balls. If we encountered particularly hard defense, we always had the option of scoring a hatch on level 1 of the rocket and getting around the defense later. This strategy allowed us to continuously have a lead during the match. In endgame, we climbed to either level 2 or level 3 of the HAB. Whenever we chose to execute a double climb, both our robot and Team 971’s robot climbed to level 3 of the HAB. During single climbs, Team 971 focused on level 3 of the HAB while we focused on climbing to level 2 of the HAB. 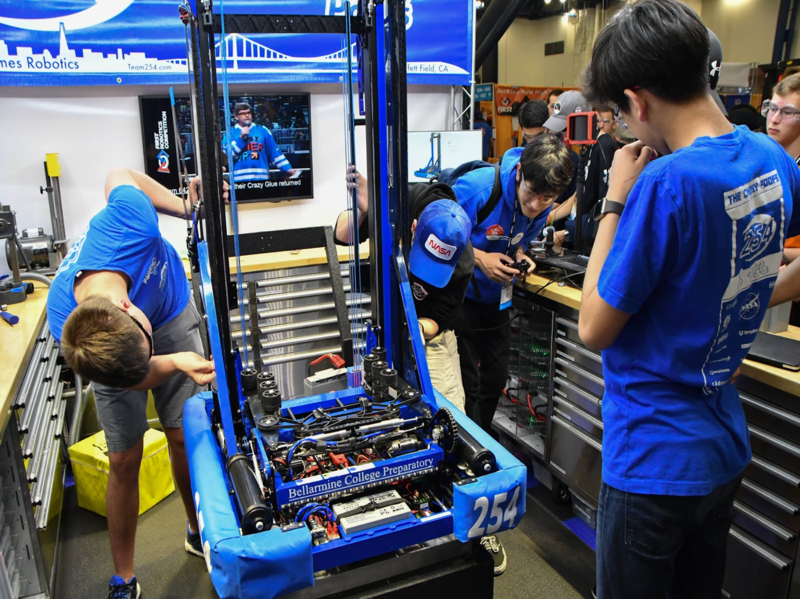 At the San Francisco Regional, we would not have been able to be so successful without the amazing teams that we were able to work with during our qualification and elimination matches. Also a special thanks for our pit crew and drive team for properly maintaining our robot during the tournament. A big thank you to the chairman’s presentation team for handling our team’s Chairman’s Presentation in front of a panel of FIRST Judges. Team 254 would also like to thank all the volunteers and judges that made this tournament an exciting experience, and all of our mentors, teachers, and parents who helped us succeed in this regional. 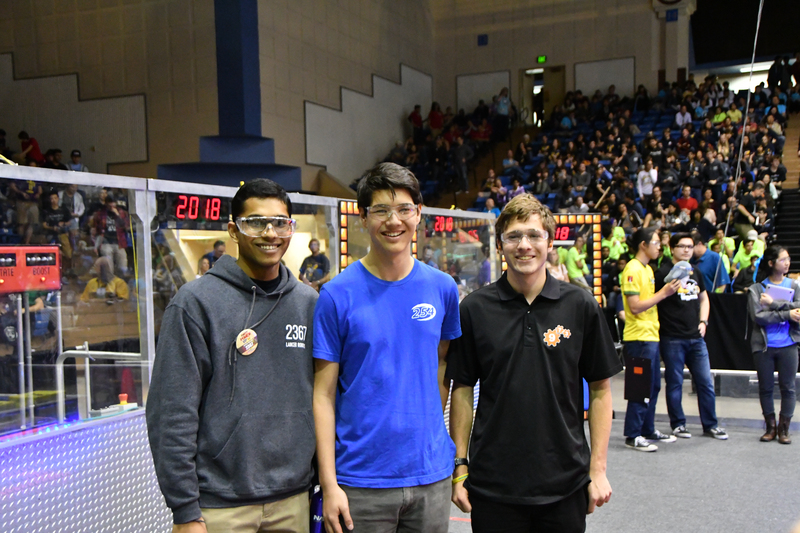 As part of an eventful weekend, we attended Capital City Classic, an annually hosted offseason tournament hosted by Team 1678 (Citrus Circuits), in Davis, CA. 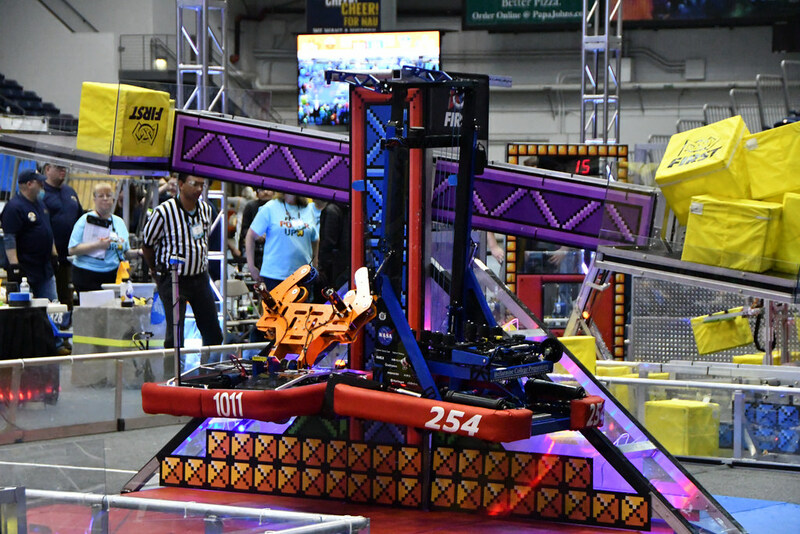 We had a great time jumping back into action with our robot, Lockdown, before the start of the 2019 FRC Season. Alongside, FRC Team 1323 MadTown Robotics, FRC Team 199 Deep Blue, and FRC Team 3859 Wolfpack Robotics, we were able to win the tournament! Overall, Capital City Classic was a great event for our team. After ending with a record of 15-0, our team members were excited throughout the tournament. With an 8 person pit crew and drive team, we were very effective and made sure the rest of our team members were at home working on our summer project robot to prepare to Madtown in 2 weeks. In general, we prioritized ranking points throughout the event. 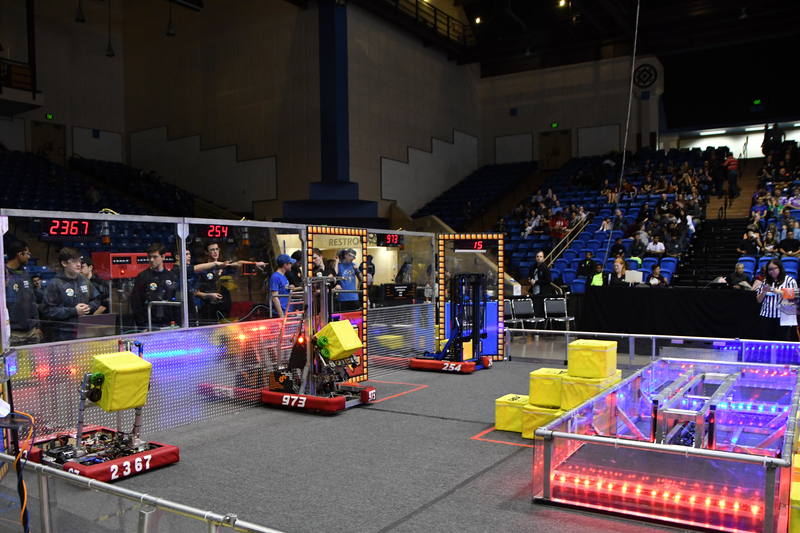 Since many robots at the event did not focus on the scale, we adopted a strategy of aggressive offense where we would score on our opponent’s switch. We would also focus on maintaining ownership of the scale and climbing at the end of the match for the extra ranking point. We ended up seeding first with 31 ranking points over 9 matches. 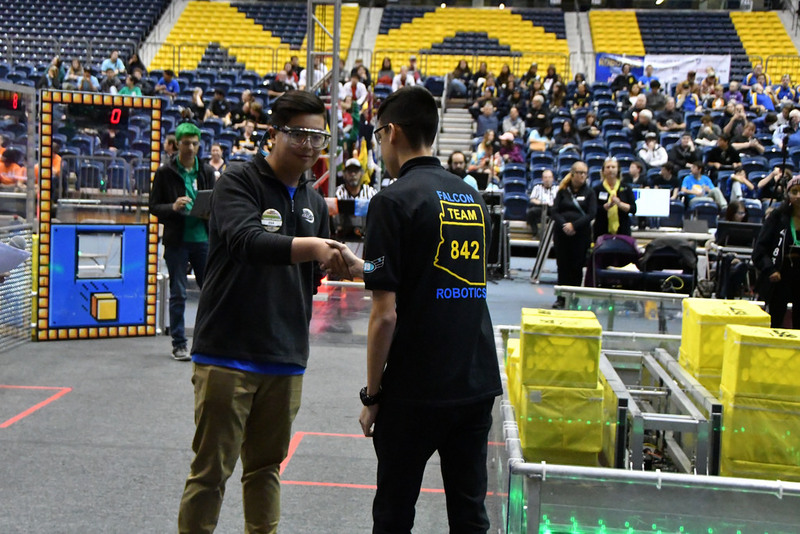 During Alliance Selection, we chose to form an alliance with Team 1323 since they had a great scale robot that could really help us establish a lead during auton. To accompany two strong scale robots we looked for two robots skilled in locking down the switches and exchange, like Team 199 and Team 3859. 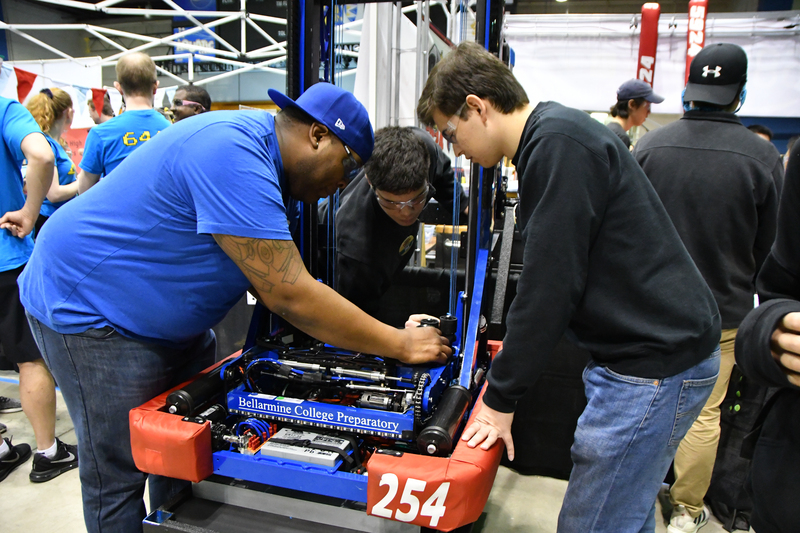 During elims, we worked with Team 1323 to lock down ownership of the scale during auton. 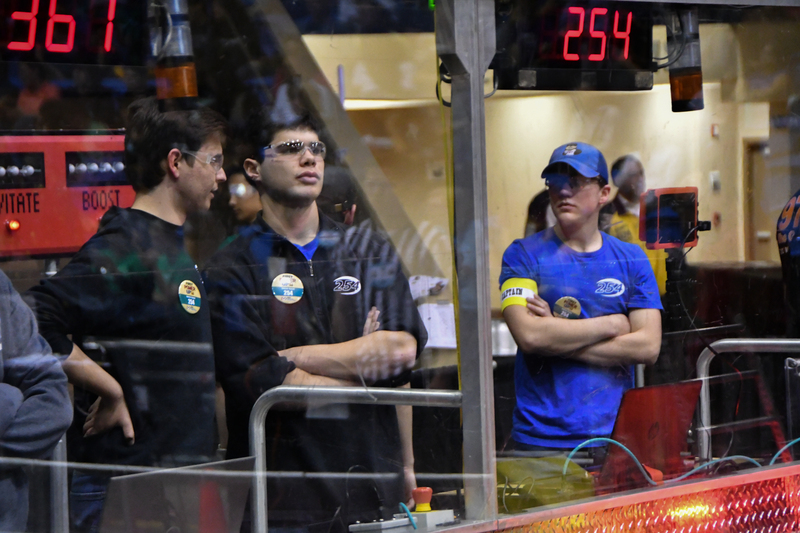 If necessary, Team 1323 would focus on offense towards the opposing alliance’s switch. During finals, we did have some scale competition with team Team 1678 and Team 1425 on the opposing alliance. Thus, we played more conservatively and made sure we had a solid buffer on the scale before rotating to other tasks. 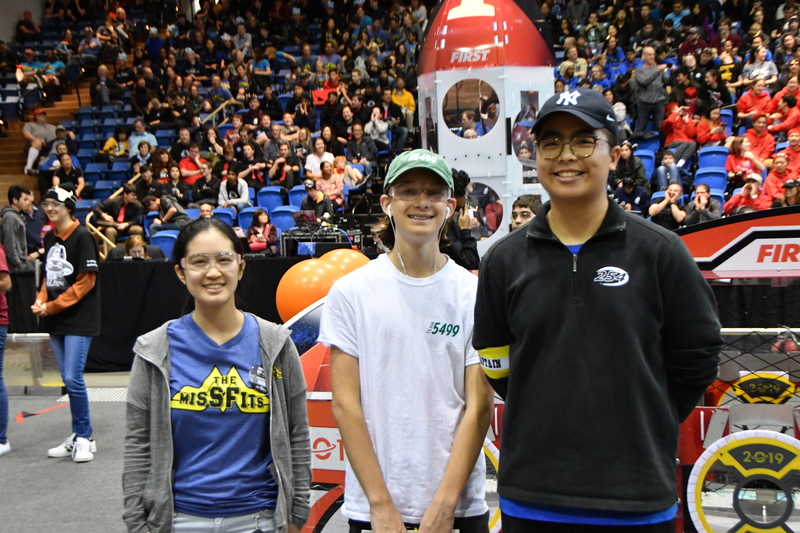 We would also like to recognize the opposing alliance of Team 1678 (Citrus Circuits), Team 1425 (Error Code Xero), Team 5458 (Digital Minds), and Team 4171 (BayBots). 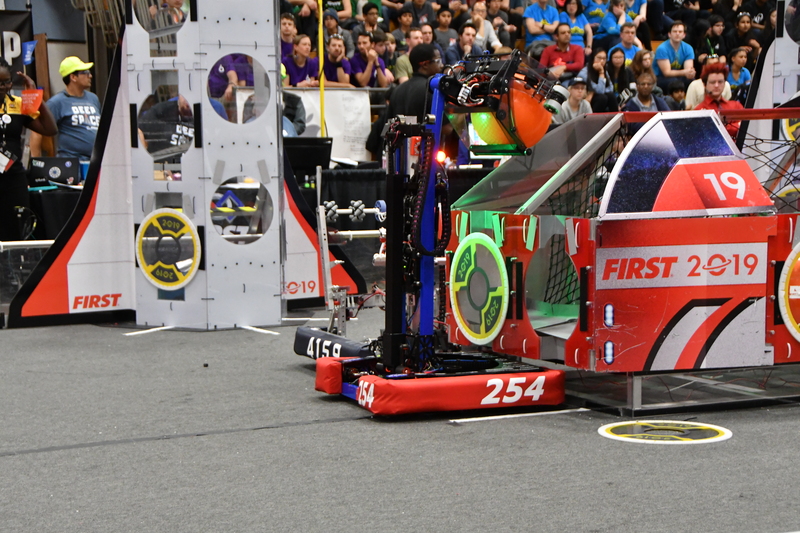 Since this was Team 254’s first time at Capital City Classic, we would like to say thank you to Team 1678 (Citrus Circuits) for hosting the tournament and making us feel welcome. 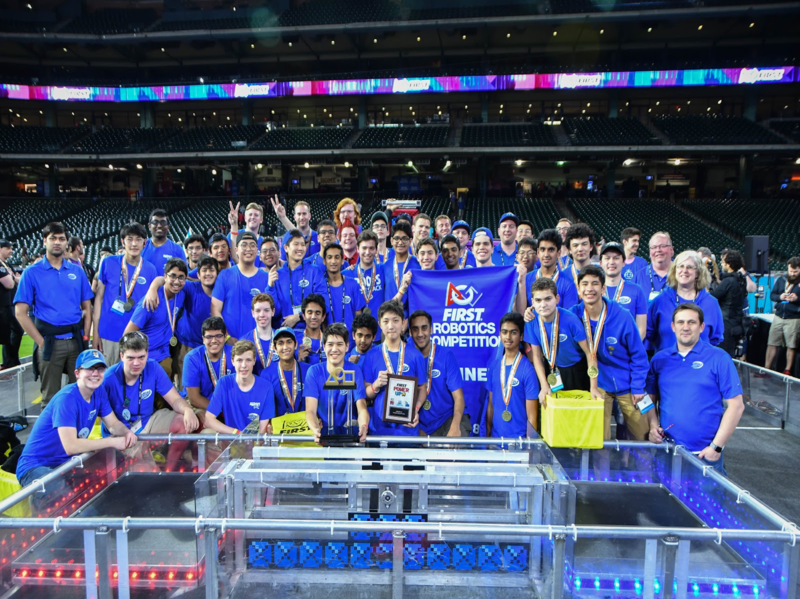 As part of an eventful week, we attended the 2018 FIRST World Championship in Houston, Texas from April 18th to April 21st. 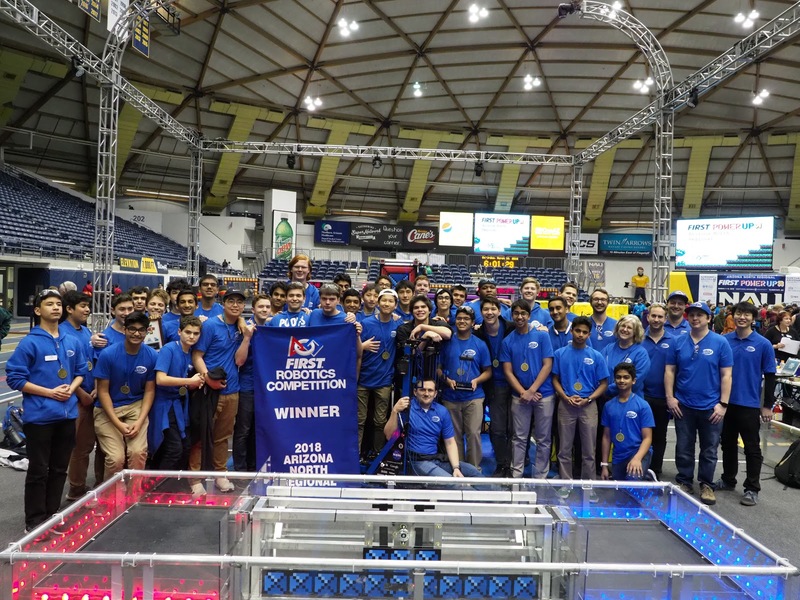 Assigned to the Hopper Division, we won the Division Championship Award and the the Autonomous Award sponsored by Ford, for our 4 cube scale autonomous program and scale detection software. 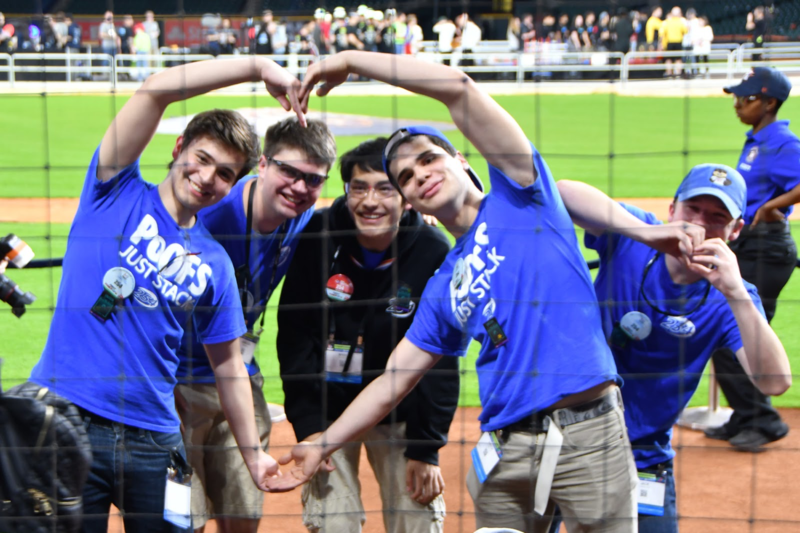 After becoming the Hopper Division Champions, we executed a well-planned strategy alongside FRC Team 148 Robowranglers, FRC Team 2976 Spartabots, and FRC Team 3075 Ha-Dream Team, allowing us to win our 4th world championship and finish with an undefeated season! 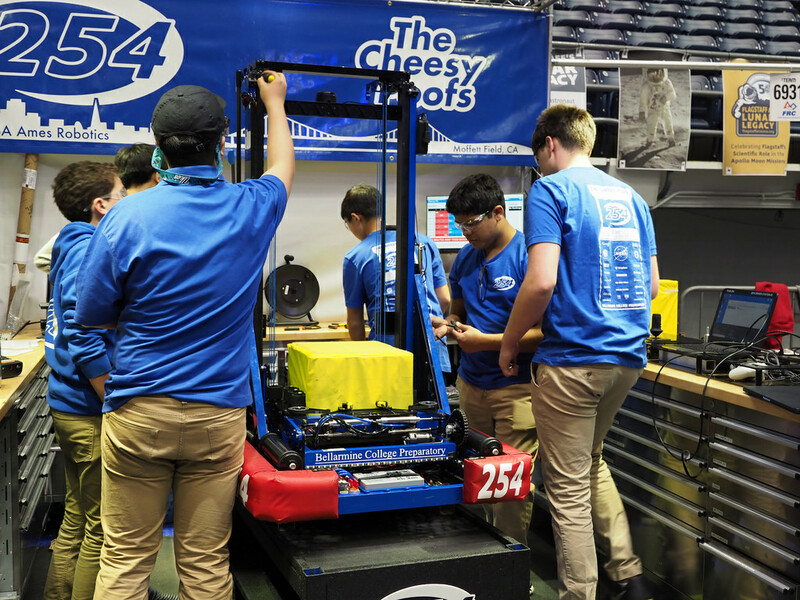 Throughout our qualification matches, we wanted to make sure that we secured 4 ranking points during every match, while still gaining control of our scale for as long as possible. 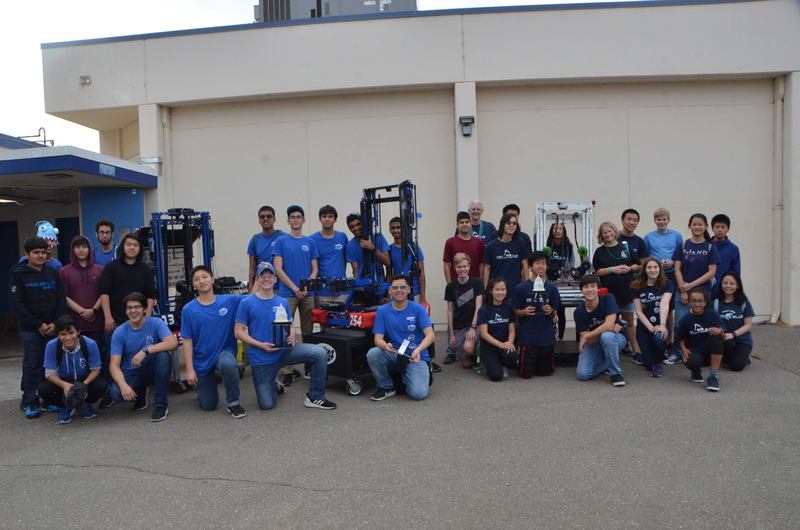 In order to do this, we ran our scale autonomous program, which placed 3-4 cubes on our alliance’s scale or, when we were not confident with our alliance partners’ ability to place cubes on the switch, we executed our autonomous program which placed cubes on the switch and scale. Going into the elimination period in the Hopper Division, we chose to form an alliance with FRC Team 148 Robowranglers, FRC Team 2976 Spartabots, and FRC Team 3075 Ha-Dream Team. During the elimination matches in the Hopper Division, we maintained our undefeated record for the entire tournament. From a strategic perspective, we aimed to always have possession of the scale and our own switch while also placing cubes on our opponent’s switch. This strategy allowed us to gain a significant lead during each match and stopped the opposing alliance from being able to score from their own switch. 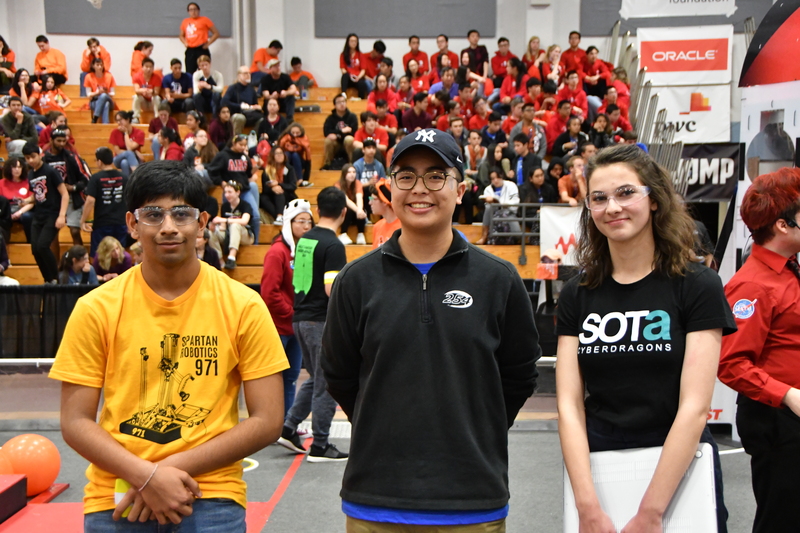 We would also like to thank Team 3075 Ha-Dream Team for helping our alliance during Finals Match 2 in the Hopper Division, while Team 2976’s robot was undergoing some repairs. 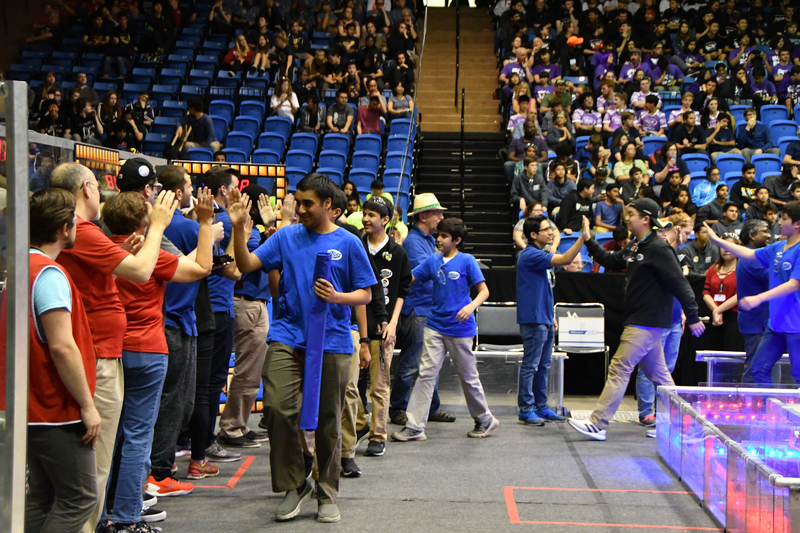 Through the efforts of our alliance partners, we were able to win the Hopper Division. 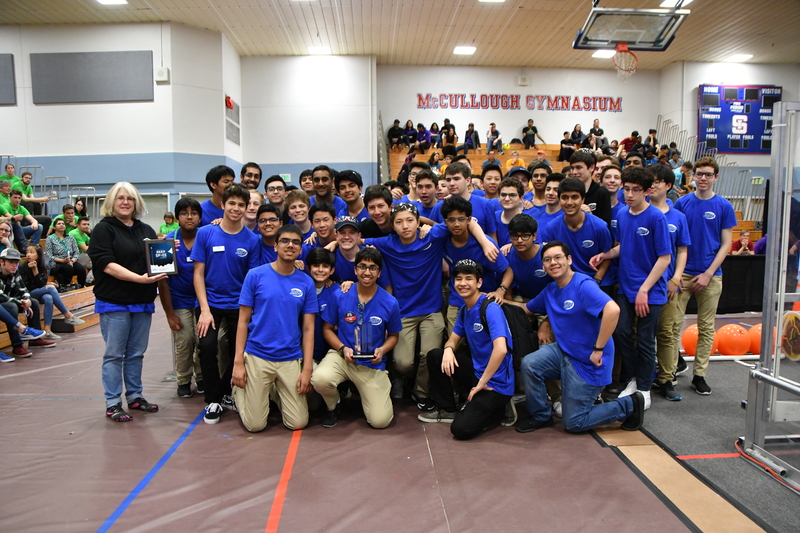 We also won the Autonomous Award sponsored by Ford, for our unique 4 cube scale autonomous program and scale detection software! We generally maintained a similar strategy during the Einstein matches as in the Hopper Division elimination round, by placing cubes on both switches and keeping possession of the scale. Team 2976 Spartabots played awesome defense on the portals to slow down the opposing alliance’s cube flow after they used all the cubes from their switch fence. Team 148 Robowranglers attacked the opposing alliance’s switch to force them to cover their switch before attacking our switch or the scale. Our drive team chose not to prioritize powerups, by placing only 3-4 cubes in our exchange for the levitate or boost powerup. With this strategy, we placed first during the round robin matches, allowing us to move on to Finals, with the Carver Division winners. 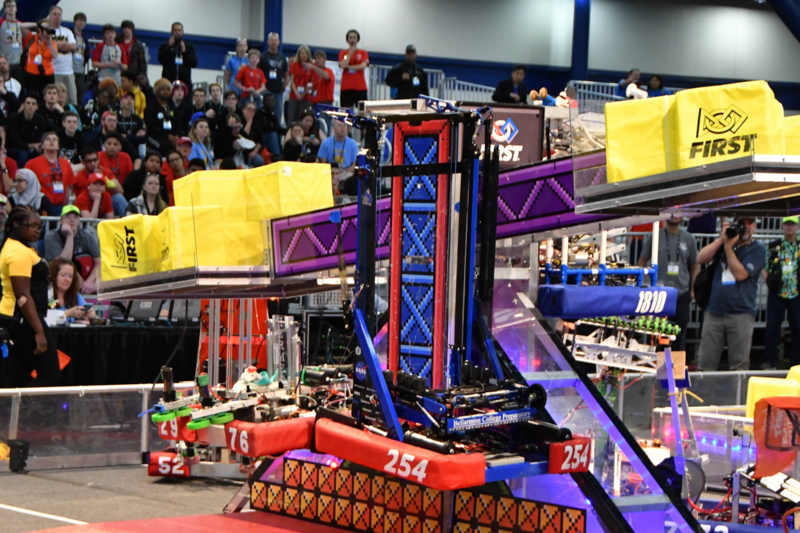 We would like to shout out FRC Team 2910 Jack In The Bot, FRC Team 4911 Cyberknights, FRC Team 4499 The Highlanders, and FRC Team 5006 Apophis, the Carver Division winners, for executing a great strategy while playing against us on the Einstein Field. 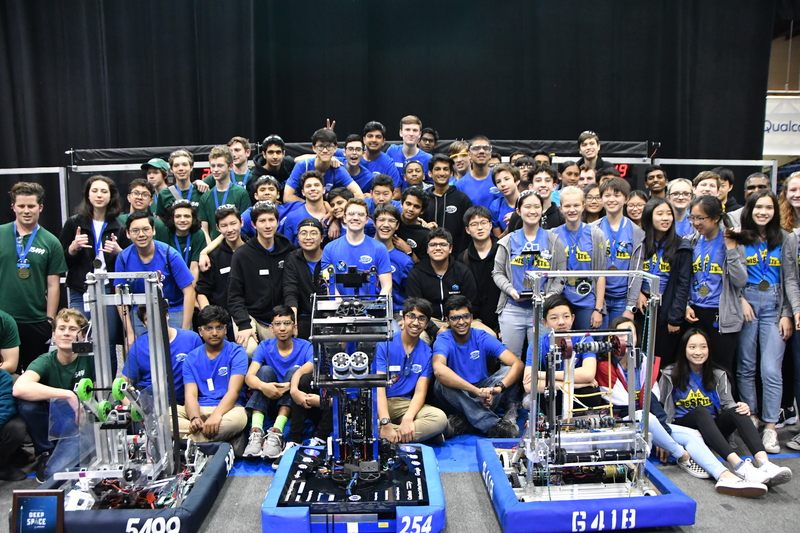 At the 2018 FIRST World Championship in Houston, we would not have been able to be so successful without the amazing teams that we were able to work with during our matches. Also a special shout out to our pit crew and drive team for properly maintaining our robot during the tournament. 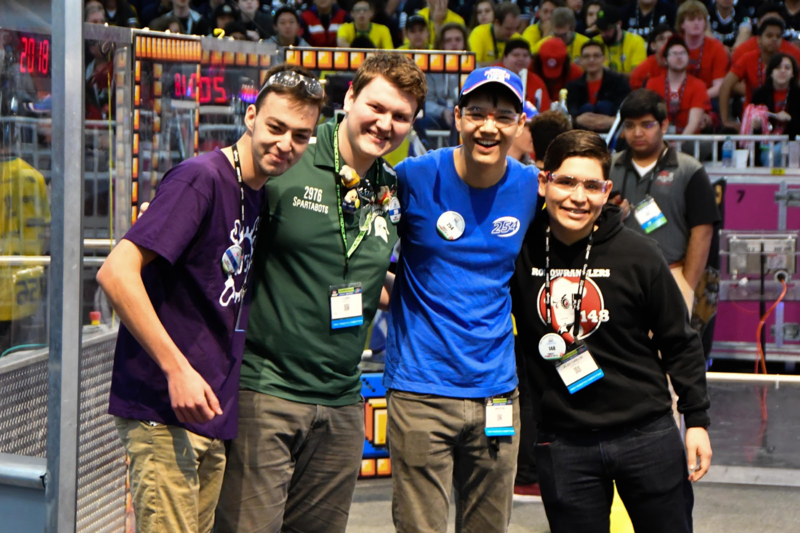 We would also like to highlight the efforts of our alliance readiness crew to keep our alliance partners ready throughout the tournament. 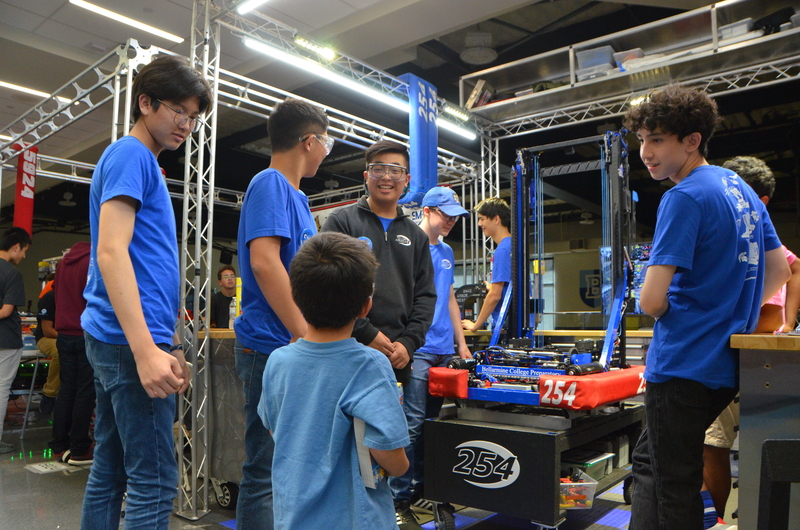 Team 254 would also like to thank all the volunteers and judges that made this tournament an exciting experience, and all of our mentors, teachers, and parents who supported us and helped us succeed in this tournament. 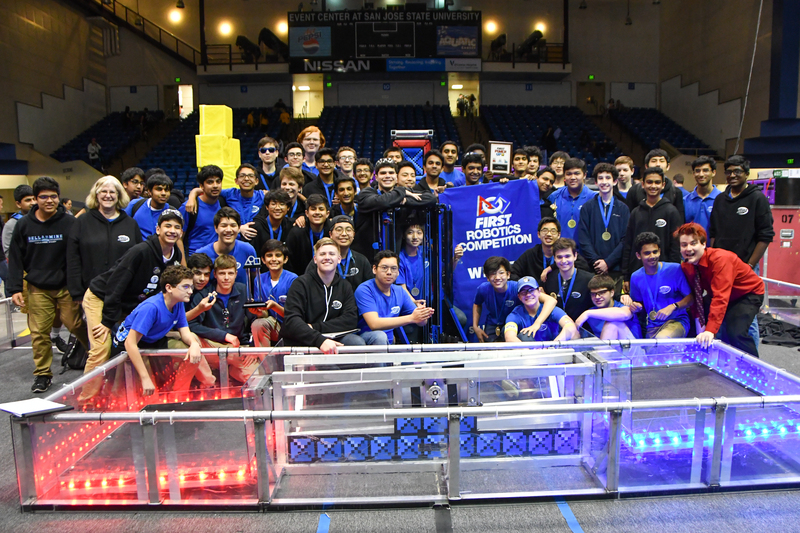 2018 Silicon Valley Regional Champions! As part of an eventful weekend, we attended the the 20th Silicon Valley Regional, in San Jose, CA. 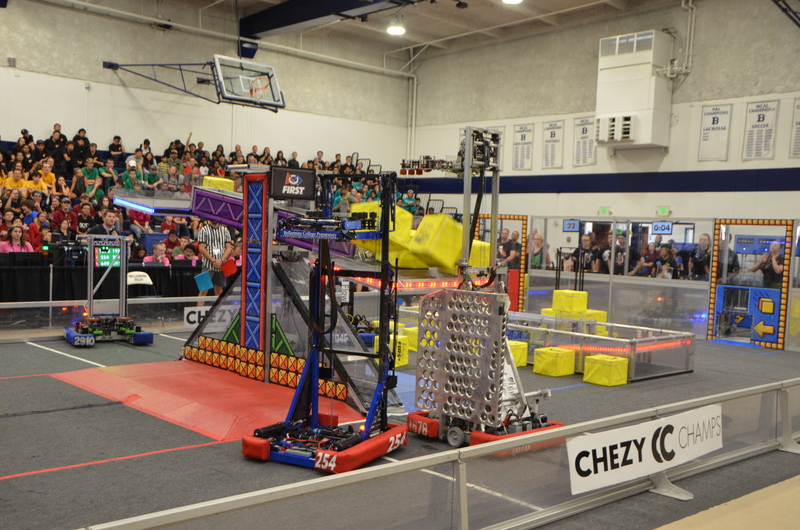 We had a great time at our second tournament of the FIRST Power Up Season with our robot, Lockdown. We won the Innovation In Control Award sponsored by Rockwell Automation for our autonomous code. Congratulations to one of our mentors, Nick Hammes, for winning the Volunteer of the Year award, for his hard work emceeing and in planning this wonderful event! Alongside FRC Team 973 The Greybots and FRC Team 2367 Lancer Robotics, we were able to win the tournament, earning our 50th Blue Banner! Throughout our qualification matches, we executed a variety of autonomous programs to ensure we were prepared for various situations. This allowed us to either place 3 cubes in the switch or place 3 cubes on the scale. 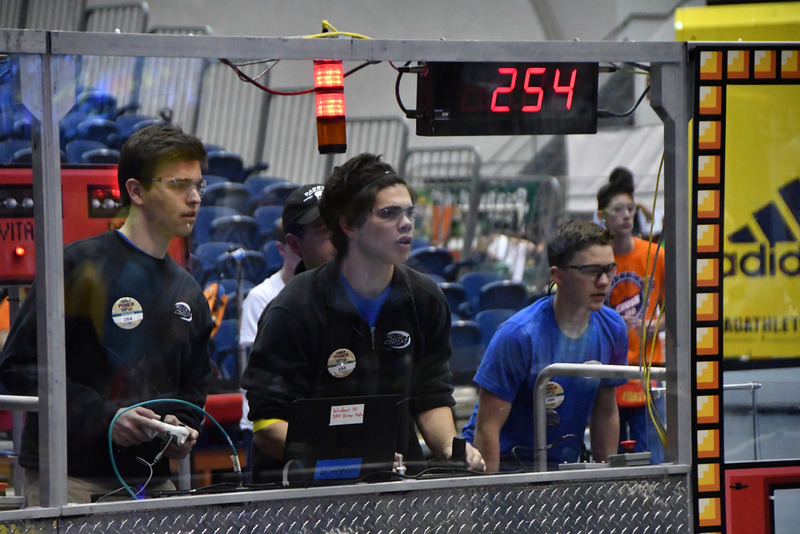 When on an alliance with robots that were good at placing cubes on the scale, we had to make sure we maintained ownership of the scale before placing cubes on ours’ or our opponent’s switch. We always tried to position ourselves on the scale platform to have enough time for hanging. During the qualification match period, we gained 4 ranking points in each match. Going into the elimination period, we chose to form an alliance with FRC Team 973 The Greybots, FRC Team 2367 Lancer Robotics. By choosing Team 973, a great scale robot, and Team 2367, a great switch and exchange robot, we were able to follow a more flexible strategy. 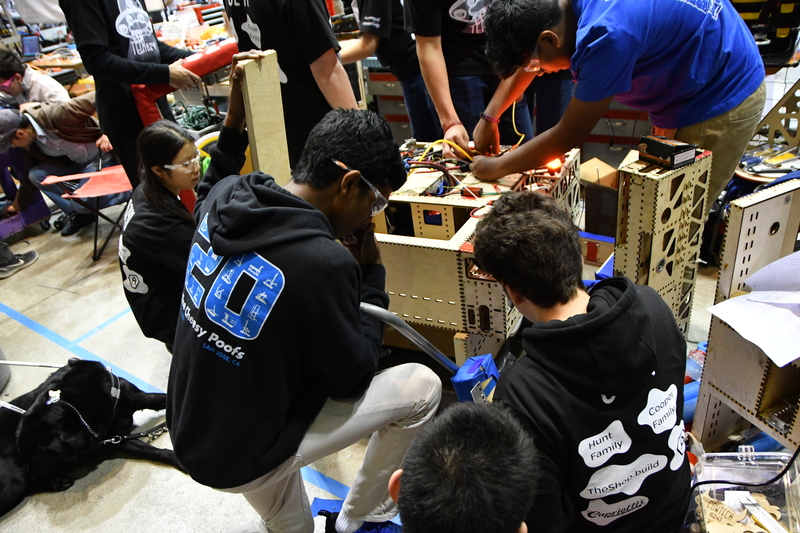 During the elimination matches, Team 973 worked with us to lock down the scale, while Team 2367 focused on keeping ownership of our switch and delivering cubes to our exchange station. To create a head start on scoring cubes onto the scale, we used our 3 cube scale autonomous program. If our opponents were good scoring on the scale, we joined 973 in maintaining ownership of the scale. When our autonomous program was successful, we worked on maintaining ownership of our opponent’s switch, using cubes from our portal. Team 2367 executed flawless and well-timed defense against the opposing alliance. With an organized strategy and great alliance partners, we remained undefeated for the season, allowing us to become the first-place alliance at the tournament and win our 50th blue banner! The Alliance Readiness Crew worked hard throughout the tournament to assist Team 6688 West Valley Middle College Robotics and Team 7317 Crusader Crew. 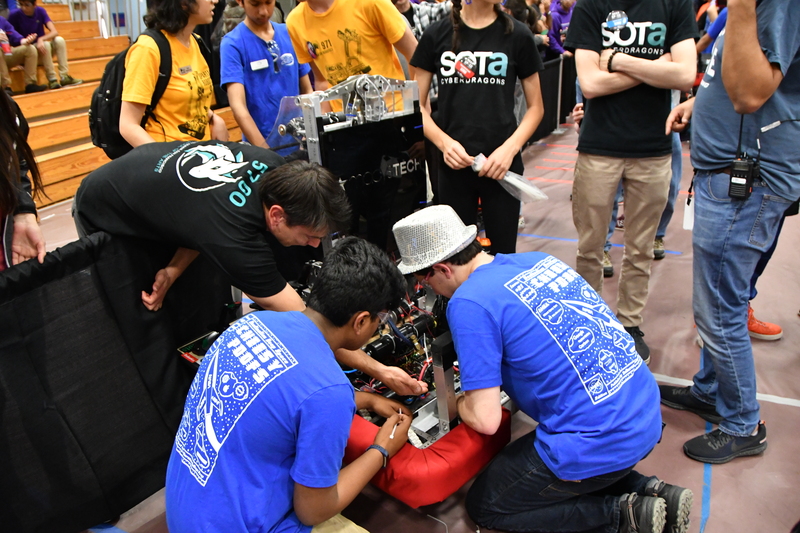 Our crew helped improve the design of Team 6688’s exhaust system, used for delivering cubes to the switch, safely wire their control system, fix their pneumatics so that there were no leaks, and write an auto that could put cubes into the correct side switch. 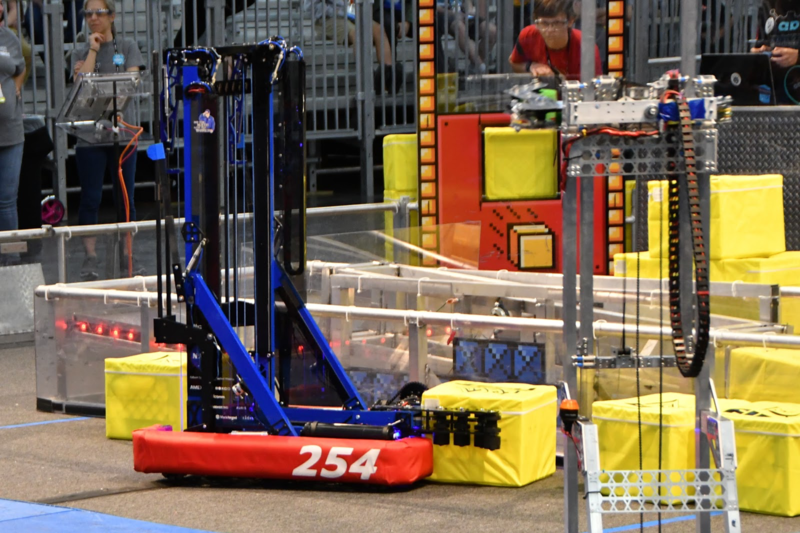 When Team 7317 needed help, our crew worked to create a new and improved intake system to collect and deliver cubes to the exchange. 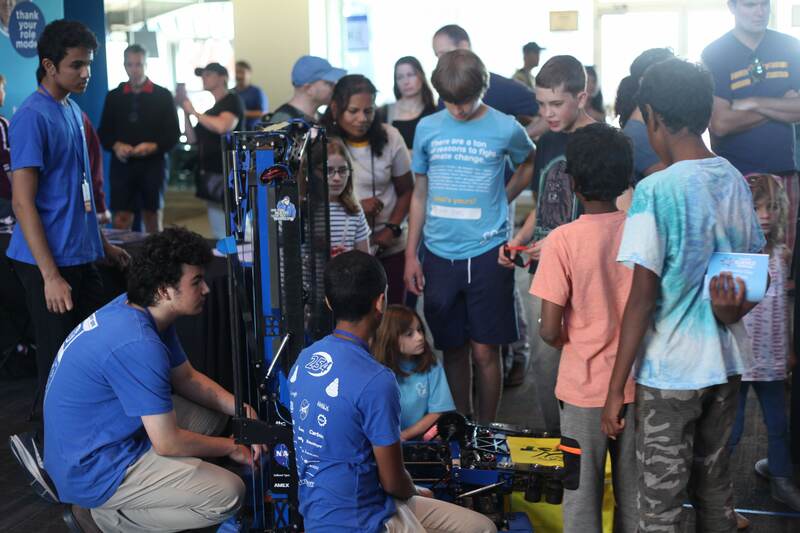 Through this experience, students were able to make friends and get more hands on with designing an actual robot. 2018 Arizona North Regional Champions! As part of an eventful weekend, we attended the Arizona North Regional, for the very first time, in Flagstaff, AZ. We had a great time starting off the FIRST Power Up Season with our robot, Lockdown. Alongside FRC Team 842 Falcon Robotics and FRC Team 2403 Plasma Robotics, we were able to win the tournament! 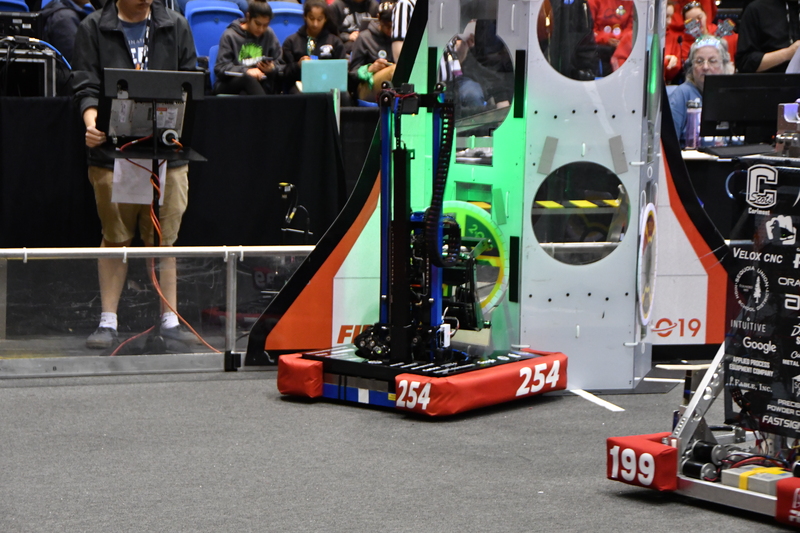 Throughout our qualification matches, we used an experimental strategy by testing out which of our autonomous programs worked best during a match. 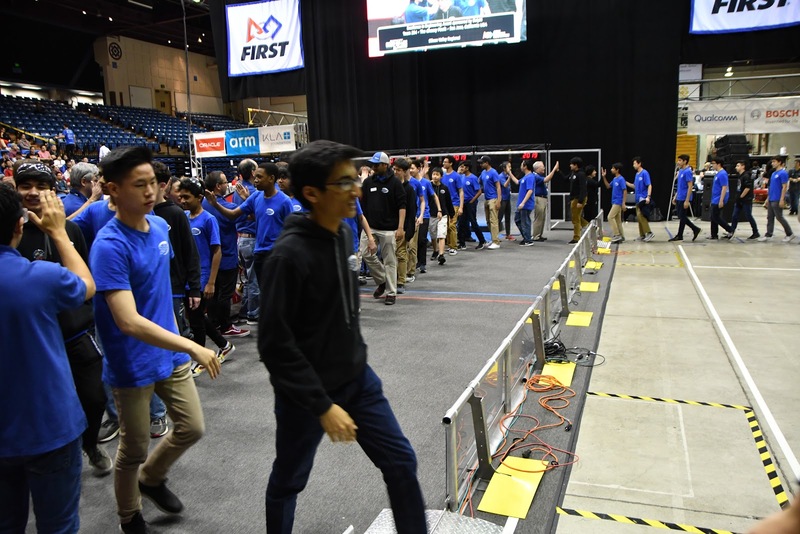 From this experimentation, we concluded that it would be best to use our autonomous program, which scored 2-3 cubes on the scale, to establish an early lead in a match. This autonomous program helped us gain ownership of the scale, but we had to focus more on maintaining ownership of the switches rather than the scale. Whenever we had alliance partners who could not secure the switch consistently, we ran our autonomous program for the switch to help our alliance partners before the tele-op period. 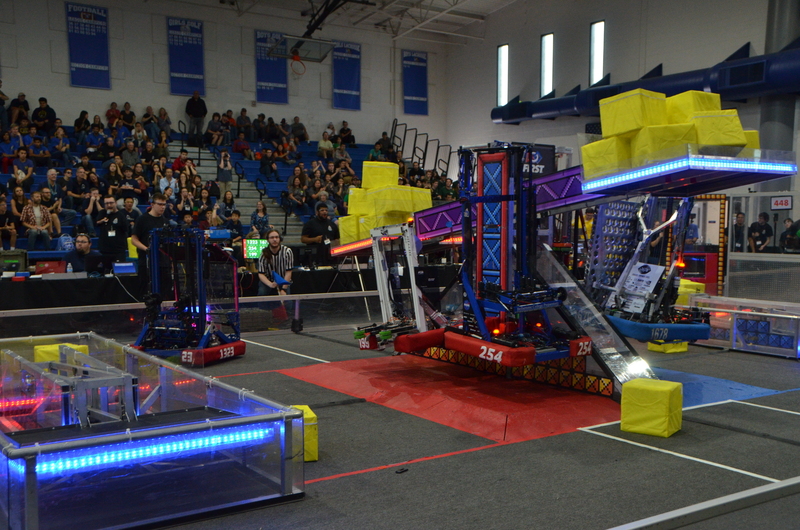 During every match, we hung with our partners and used the levitate power up for an extra ranking point. By the end of the qualification match period, we were seeded first and had a undefeated record. Going into the elimination period, we chose to form an alliance with FRC Team 842 Falcon Robotics, FRC Team 2403 Plasma Robotics. During the elimination matches, we maintained our undefeated record for the entire tournament. Our autonomous program and Team 842’s robot, worked to score on the scale during each match. This allowed us to score on switches, while Team 842 covered the scale during the tele-op period. We also focused on stopping our opponents from gaining ownership of their own switch. If we had spare time during a match, we passed cubes through the exchange. Team 2403’s robot worked to gain ownership of our own switch and we also helped with scoring cubes in our switch. During finals, Team 2403 focused on switch, exchange, and defense against opponents who tried to take ownership of our switch. 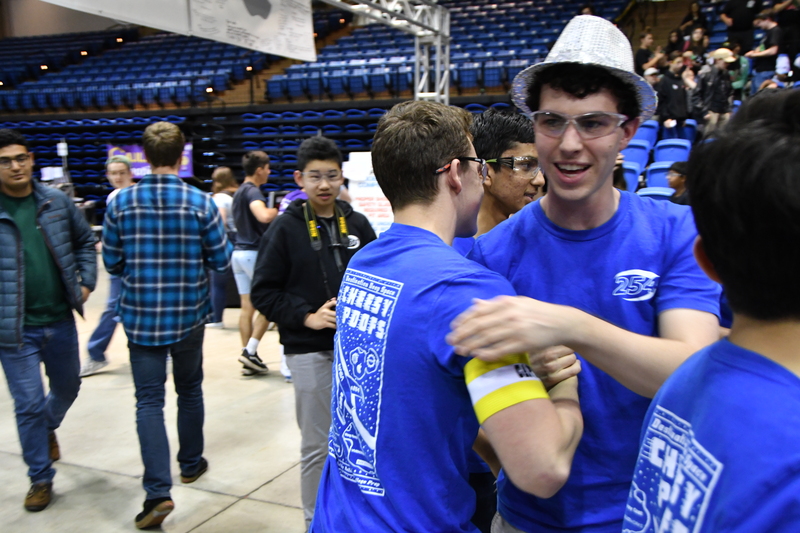 With an organized strategy and great alliance partners, we scored an all-time high of 594 points in Finals Match 2, allowing us to become the first-place alliance at the tournament! 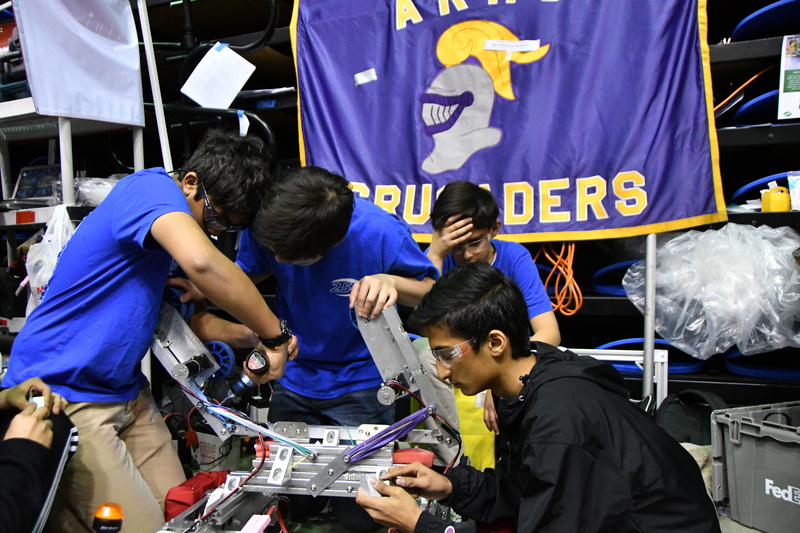 The Alliance Readiness Crew worked hard throughout the tournament to assist Team 6585 Hózhóogo Naasháa Doo and Team 6656 Ryu Botics. When Team 6656 needed an intake, our crew searched for the necessary parts and mounted a simple 2-wheel intake onto their robot. In addition, we helped them write an autonomous mode that crossed the auto line consistently. 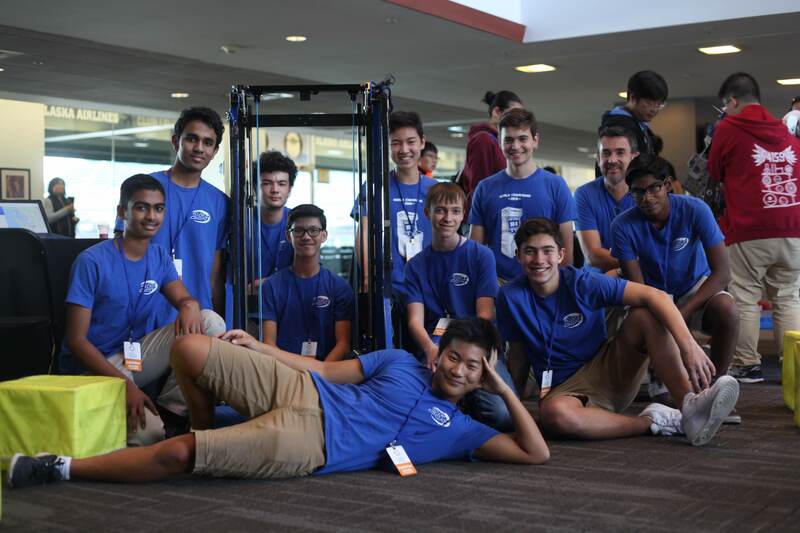 When Team 6585 needed a robot, our crew worked for 3 days to build and wire a drivebase, 2-wheel intake, and a polycarbonate box for collecting cubes from the portal. Through this experience, students were able to make friends and get more hands on with designing an actual robot. 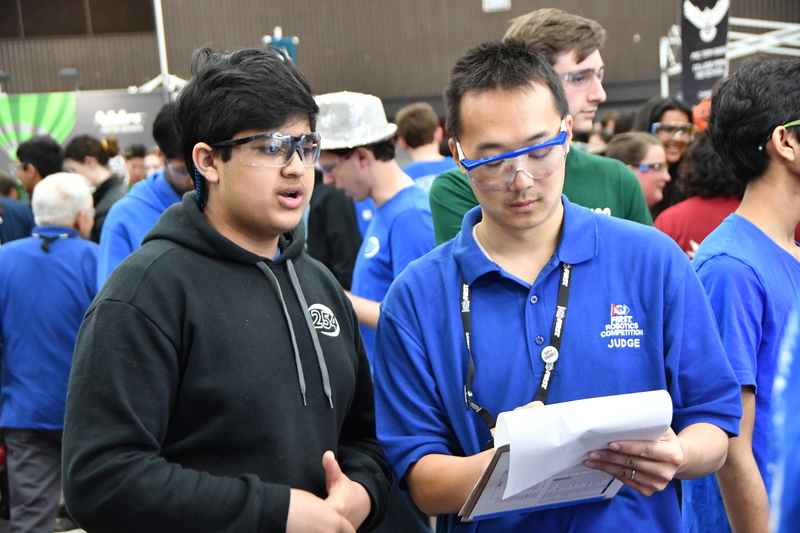 At the Arizona North Regional, we would not have been able to be so successful without the amazing teams that we were able to work with during our qualification and elimination matches. Also a special thanks for our pit crew and drive team for properly maintaining our robot during the tournament. A big thank you to the chairman’s presentation team for handling our team’s Chairman’s Presentation in front of a panel of FIRST Judges. 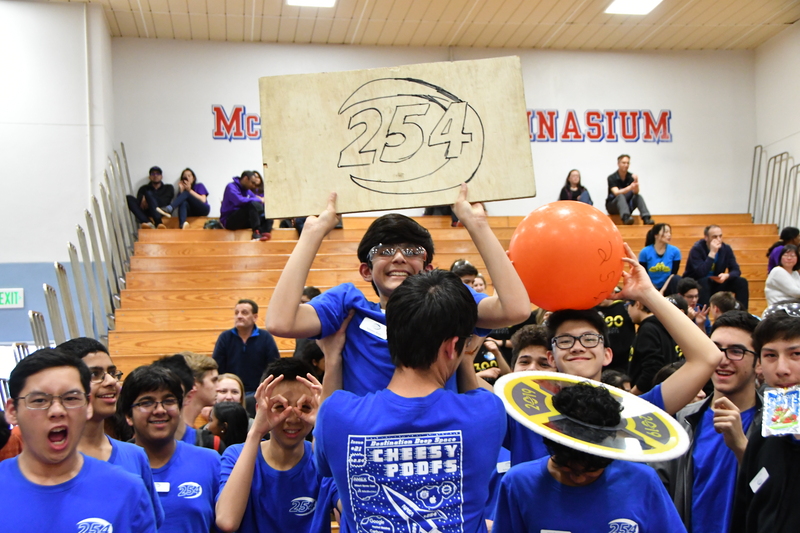 Team 254 would also like to thank all the volunteers and judges that made this tournament an exciting experience, and all of our mentors, teachers, and parents who helped us succeed in this regional. On Friday, 2/23, we handed off practice bot to the programmers to begin working on autonomous code. The programmers rewrote a large portion of our code to greatly simplify all our state machines and change the way operator controls work. They separated operator controls into wrist angle presets and height presets and experimented using an xbox controller rather than the button board. They also began working on some autonomous actions for intaking, setting superstructure position, and shooting/placing cubes. We had our first round of driver tryouts, where all 254 members interested in joining drive team participated in a written test. The purpose of the written test was to test one’s knowledge of the Game Rules and Drive Team Positions during a match. A few lucky students were chosen to move on to the second level of drive tryouts where they were able to drive Misfire, our robot from last year. Students were asked to pick up gears from the field and place them on a makeshift peg, using the controls on our driver station. After these two rounds of tryouts, we narrowed our choices for students on the drive team, and will finalize our choices over the course of this week. To facilitate driver practice this weekend, we rigged up the wooden lever arm of the scale we got from the SJSU kickoff onto the aluminum scale we are currently constructing. 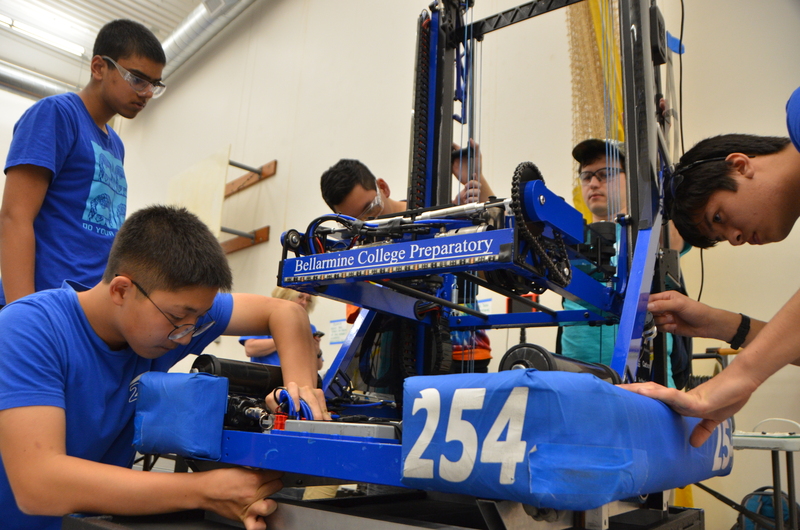 Our driveteam also practiced with Team 973 and Team 5499 throughout the day. 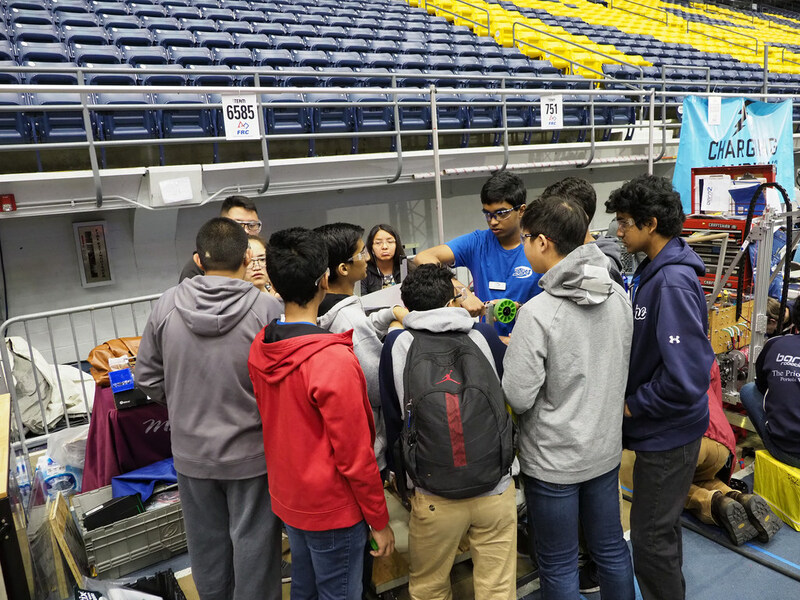 On Saturday, 2/24, we worked on getting programming bot to the same state as competition bot. This year, driving is an especially critical component of the game. 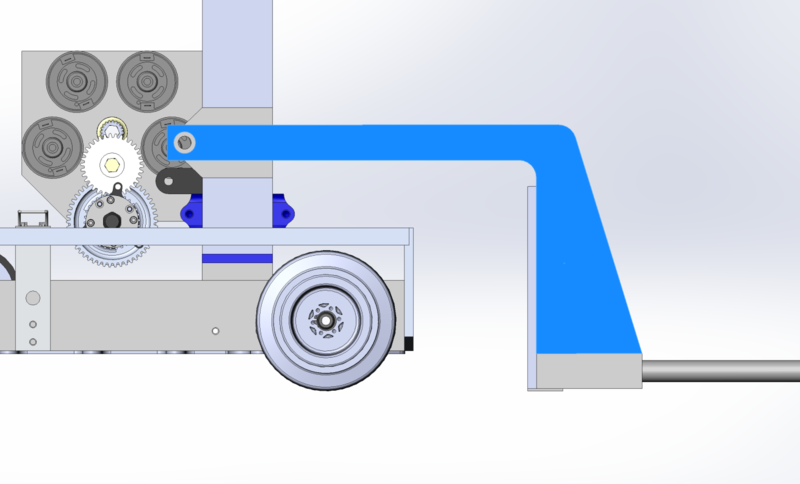 Because our robot accelerates extremely quickly with the 6 MiniCIM drivetrain and has a high CG with the elevator, the driver needs to have confident control over the robot's motion to ensure it doesn't tip over and the operator needs to have confident control over the robot's operations to ensure our mechanisms are stowed unless needed and do not accidentally hit parts of the field. On Friday, 2/9, we assembled together the elevator on comp bot and tested out how wheel the intermediate stage and carriage slid with the bearing blocks. As we were sliding the stages, we noticed that the carriage was ripping off the powder-coating on the intermediate stage, so we decided to manufacture new inner stage uprights to be anodized for comp bot. We also assembled all 3 carriages and sanded down the welds. On Saturday, 2/10, we started putting everything together on all 3 robots. 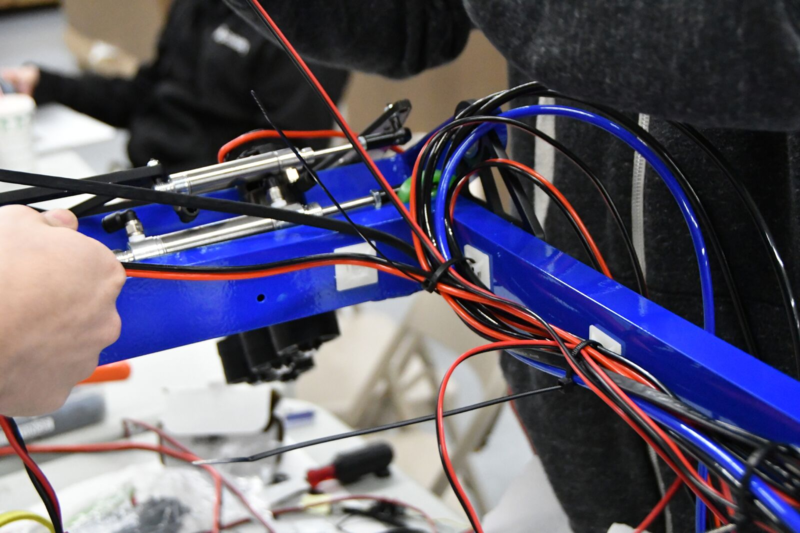 We installed all the bearing blocks and forklift brackets, and began wiring up the comp bot with the IGUS chain. We also decided to hook up a magnetic limit switch to the top of the horseshoe to detect the distance between it and the carriage. That switch will be connected to the encoder on the elevator gearbox. We also assembled an intake without the pivot arms and mounted it to programming bot to test out how well it works. On Sunday, 2/11, we worked on manufacturing more parts to send out for anodizing on Monday, 2/12, and we cabled up the elevator on practice bot and tested it out. We noticed that the elevator moves slower than we thought which may require a change in gearing, and we also noticed that the cable runs are too close together which may prove problematic for spitting the cube out the back. 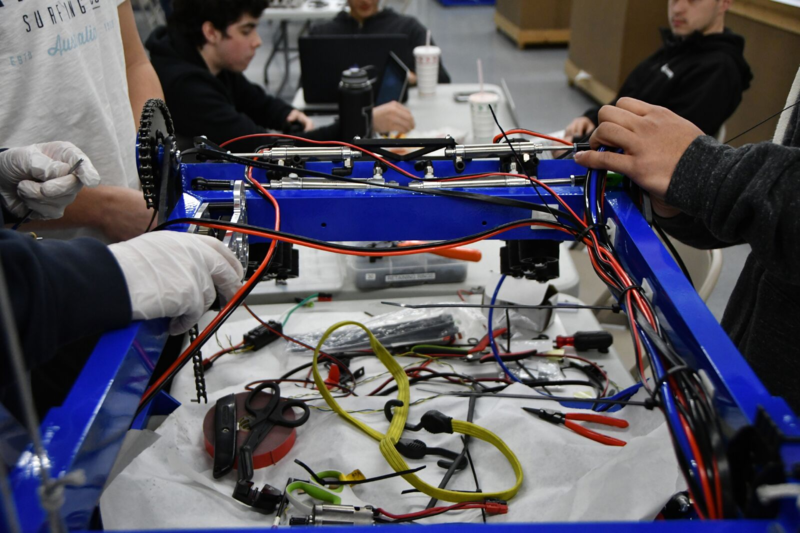 On Wednesday, 2/14, we began assembling the programming bot and competition elevator gearboxes. After testing the elevator on Sunday night, we realized that it moved much slower than expected. 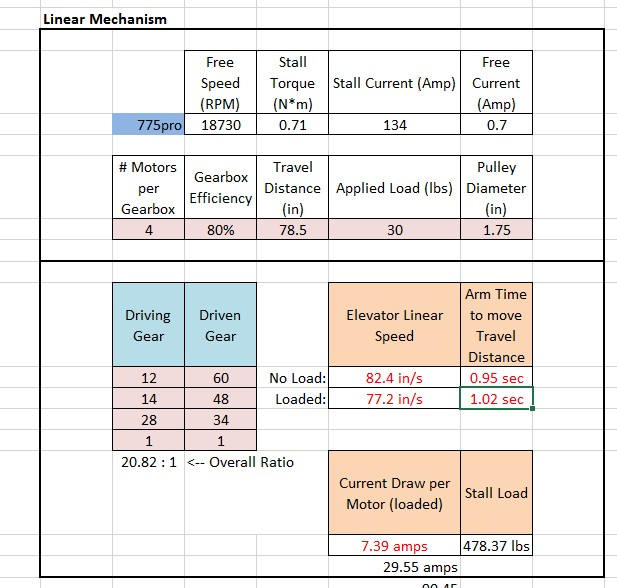 To fix this, we swapped out the last stage gear reduction from an 18:50 to a 24:44 which theoretically allows us to climb 78.5" within 0.76 sec. We got back the intake pivot weldments from powder-coating and assembled them on practice bot. On Thursday, 2/15, we continued work on assembling the intake. We wired up the CAN coming up from the PDP into the talon, then had the CAN daisy chain from the talon to the canifier, and then had the CAN terminate after the canifier with a 120 ohm resistor. The canifier will be used to breakout various DIO sensors we plan on placing on the intake such as magnetic limit switch sensors for soft stops for the intake pivot and beam break sensors for cube detection. We wired up the motors and pneumatics on the intake, and tested it out. After 4 intense days of early mornings and late nights, we bagged and tagged our completion robot last night! Thank you to all the students, mentors, and parents who made this build season possible! Saturday, 2/17: We handed off the the practice bot to the programmers to begin tuning the wrist pivot and the elevator. Sunday, 2/18: The programming team continued tuning practice bot. We continued assembling and wiring competition bot. Monday, 2/19: The programming team took competition bot to tune the mechanisms while the assembly team took practice bot to mount the forklift and hanger. We tested out both the forklift and hanger and saw that the sneaky hang with a partner was able to support two robots. While doing a solo sneaky hang, the robot did swing in which we expected to happen. We mounted a rollercoaster arm on practice bot hoping to counteract that swinging, but rather it only caused the robot to now pivot around where the rollercoaster arm contacted the scale. 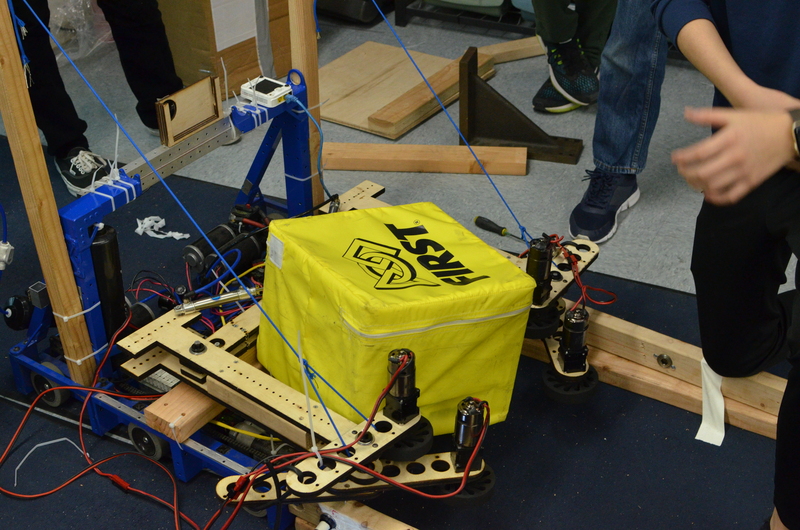 After all this testing, we decided to remove the partner hang and only mount the sneaky hang on competition bot. Tuesday, 2/20: Stop build day! We finished up all the wiring and assembly on competition bot and took pictures of it. In the last hour, the programmers took the robot to test it, and we noticed a few issues arising with the intake, Omni followers, and sensors which will need to be corrected at competition. We bagged the robot at 115.9 lbs as well as a tote full of spare parts. We decided to offset the A-Frame from the frame rail to allow more space for the intake to open and close in between. To do so, this also required moving the frame rail closer to the elevator such that it would not interfere with the omni followers. We finalized the outer stage and A-Frame of the elevator, manufactured all the parts, and sent them out to be welded. We decided to have the igus chain ride on a polycarb guide on the same plane as the outer face of the upright. The igus chain will attach to the top of the polycarb guide, will curl around the side tube of the carriage weldment, and will bolt to the inside of the carriage. We also moved the pulleys in a little on the bottom side of the horseshoe to make space for our pit crew members to easily put in the thumbscrew bolting the bumpers to the back of the frame rail. We adjusted the forklift pivot and piston to work around the A-Frame by using a larger bore piston with a smaller stroke. 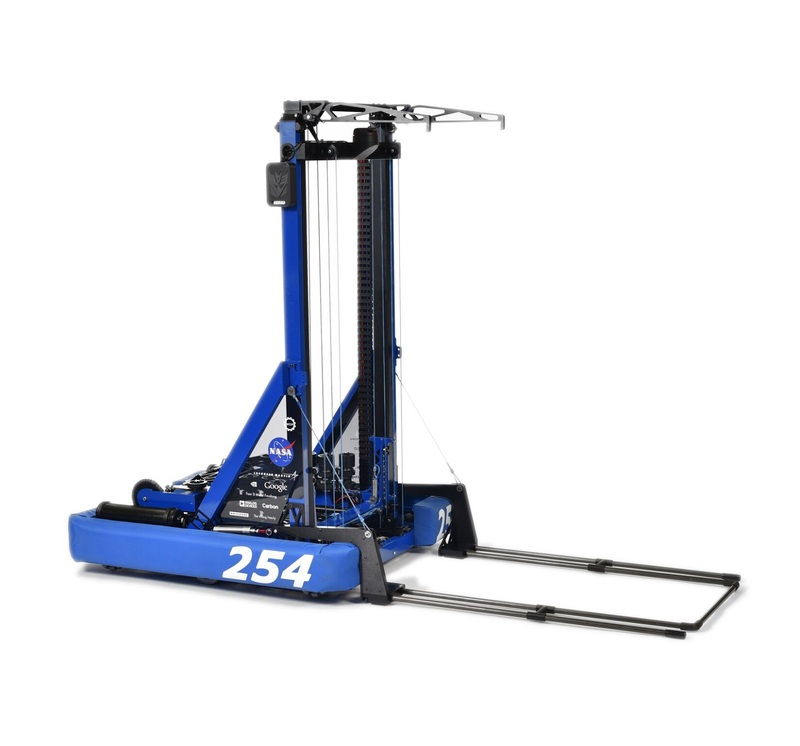 We had initially planned on using a 3/4″ bore piston with a long lever arm, but because we decided to move it within a protected area and closer to the elevator, the lever arm decreased and thus required a larger bore piston to hold the forklift upright. 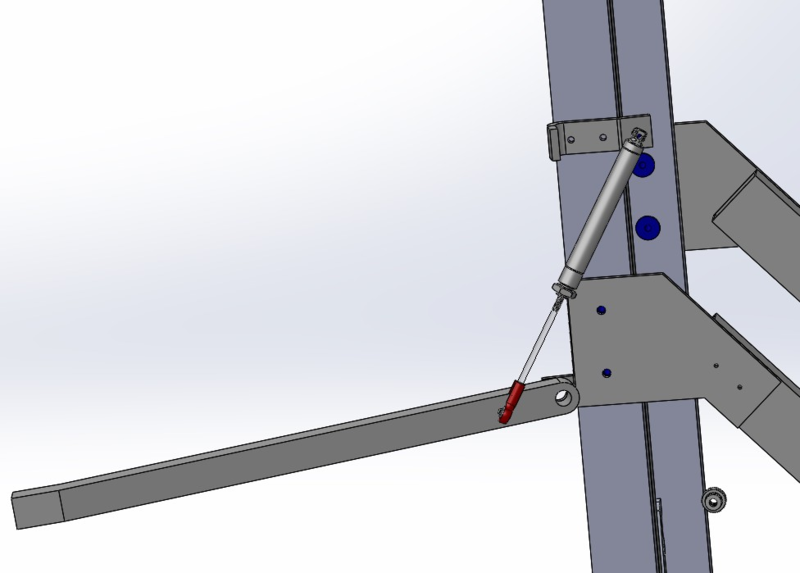 We also finalized the tensile member which will be a steel wire bolting from the elevator to a-frame gusset to a standoff on the forklift and added a crossmember between the two forks. We completed the design of the rollercoaster wheels. We decided to use metal lanyards as the deploying hardstop. In addition, we chose to use a ball bearing with a 3D printed cover to increase the size of the wheel without increasing the thickness. Over the past two builds, we completed wiring the practice, programming, and comp bots. We also installed all necessary gearboxes and chains on each drivebase. So far, the practice and programming robots are set with pneumatics. 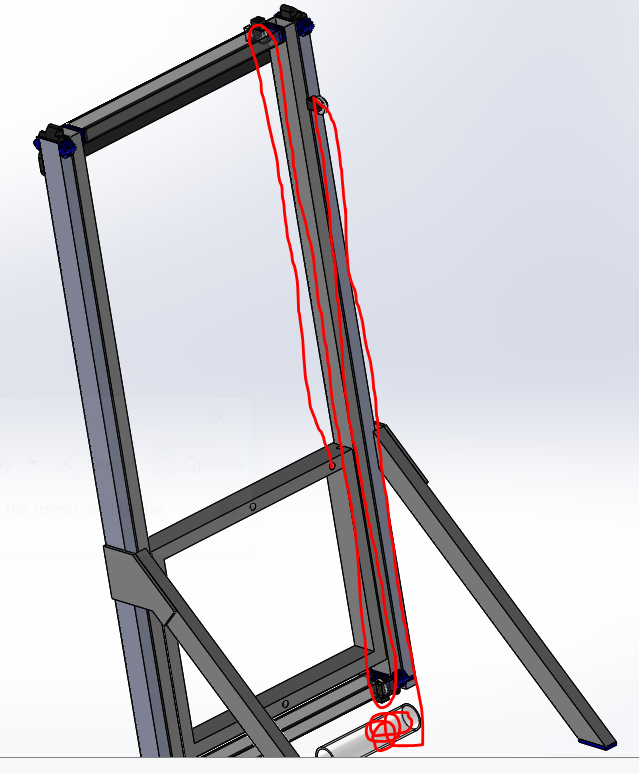 At our next build, we plan to finish plumbing the pneumatics on the comp bot. Shockwave Shows Off Some Mad Skills! As part of an eventful weekend, we participated in a successful outreach event at Stanford, CA. 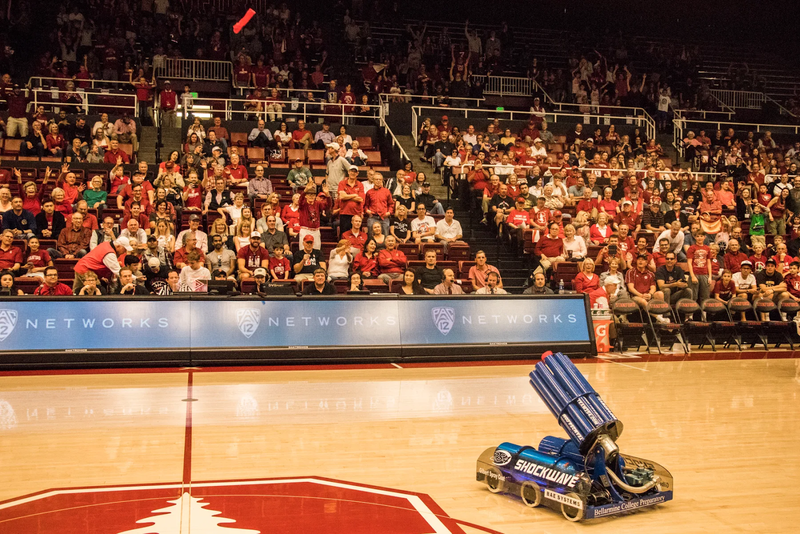 Due to the efforts of students on our outreach subteam, Team 254 students were excited to have the opportunity to present Shockwave at the Stanford Basketball Game, where Stanford played against the Oregon Ducks from the University of Oregon. 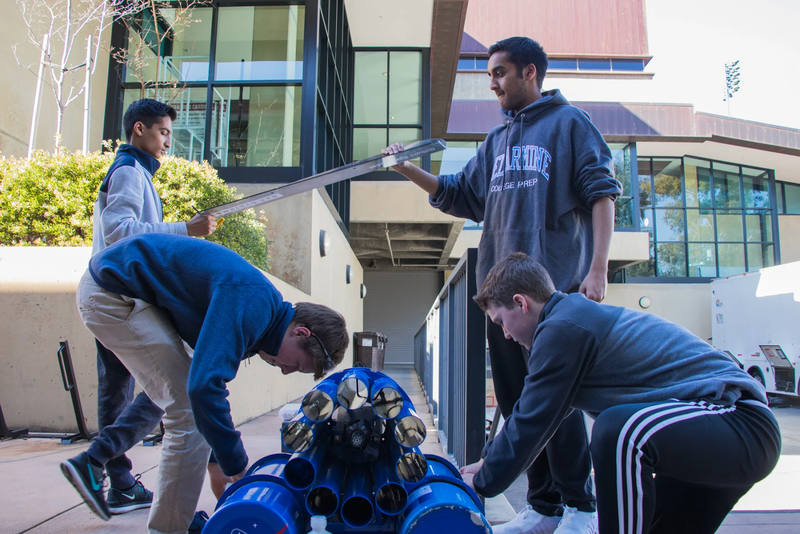 During a timeout in the first half of the game, Team 254 students Yusuf Halabi, Shruthik Musukula, Jack Gnibus, Griffin Soule, and Mubashir Hussain worked together to operate Shockwave and launch several Stanford t-shirts into a crowd of approximately 8,000 people. We are extremely grateful to have such an opportunity and would love to support Stanford University in the future! 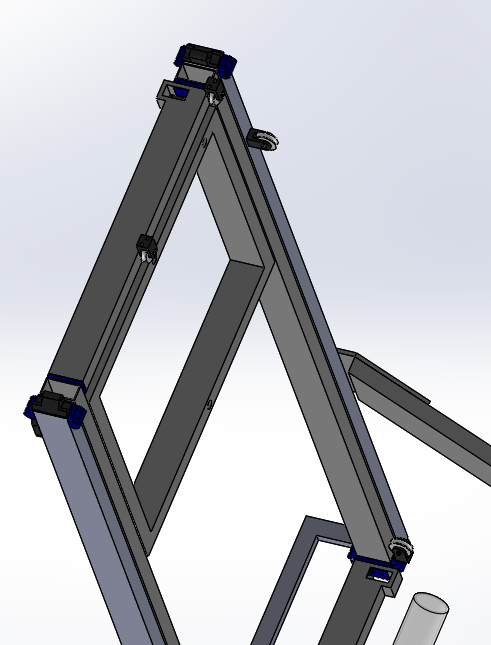 We changed the placement of the A-Frame by pushing it further towards the front of the robot and higher up the outer stage elevator upright such that the bumper latch could freely swing without contacting it, and we made the corresponding changes to the gusset joining the A-Frame to the outer stage elevator upright. We also modified the horseshoe plate to accommodate the omni follower wheels on the back of the robot by having the cutout fit around a space of the follower wheels. To ensure that our forklift would not contact our pulleys and cables when stowed within the frame perimeter, we looked into pushing the pulleys closer to the sides of the elevator, but realized that they would then interfere with the carriage as it traveled up. Instead, we decided to adjust the forklift pivot such that it could stow vertically and not have the carbon fiber rods leaning into the elevator assembly. 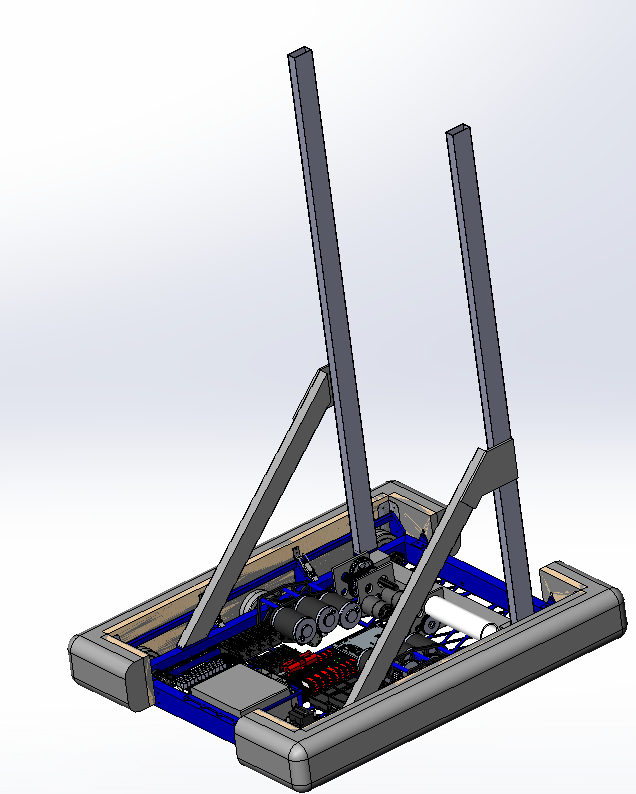 Moving forward, we will also need to design in a part to protect the pulleys in case the forklift sways while we accelerate across the field during a match. 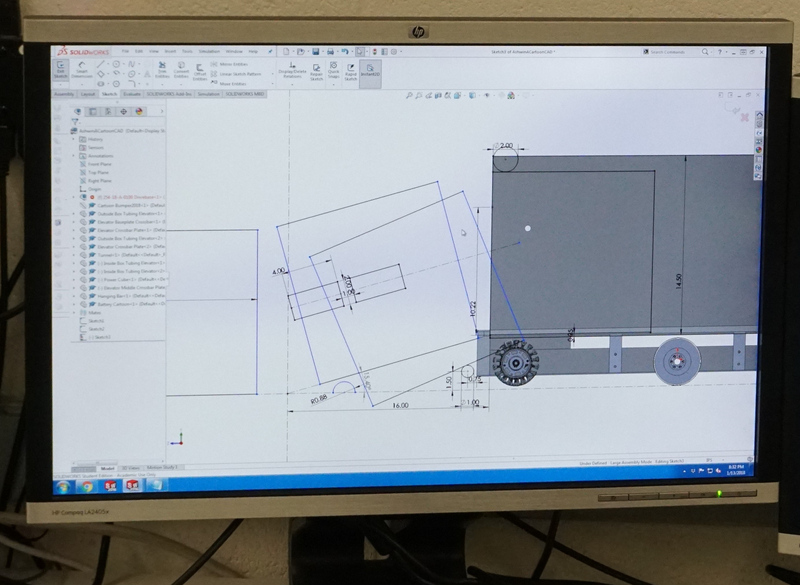 We also modelled in a new piston pivot off the lower part of the A-Frame to actuate the stowing/deploying of the forklifts. We decided to move this piston to be above the frame rail and below the top of the bumpers such that it is in a protected area. If it was kept in its previous configuration, a robot could have easily come in and hit it, which would have rendered us incapable of actuating the forklifts for that match. We finished wiring the PCM on the Practice and Programming Robots. We also finished wiring all the Talons for each robot. Lastly, we worked on gathering and assembling the pneumatic systems for each robot. Today, we finished the odometry calculations necessary to track the robot’s position using the follower wheels. The main difference from last year’s code is the inclusion of the back follower wheel, which can be used to detect sideways slip when making turns. We are pretty much ready to test the follower wheels once they are ready, but we still need to figure out where the encoders will plug in so we can finish up the code. We finalized the elevator gearbox and pulley placement. To ensure the gearbox does not get in the way of the carriage, we decided to stow it below the elevator and belt out to reductions and the spool. We will have two spools, one on each side. Each spool will be divided into two sections by a flange: one section for the pull up cable and one section for the pull down cable. To avoid the carriage sweeping through in front of the elevator, we decided to have our cable runs go on the back of the elevator then come below the horseshoe and back onto the spool. We extended the horseshoe onto the frame perimeter to give us space to bolt the pulley assemblies and also to bolt into the frame rail to provide overall structure to the elevator assembly. We finalized the geometry of the rollercoaster wheels design. We determined that we should have the piston mount to a plate mounted off the upright. This eliminates the original need for two degrees of freedom with two rod ends. Our plan is to start detailing the parts, finalizing that everything packages, and doing stress analysis. 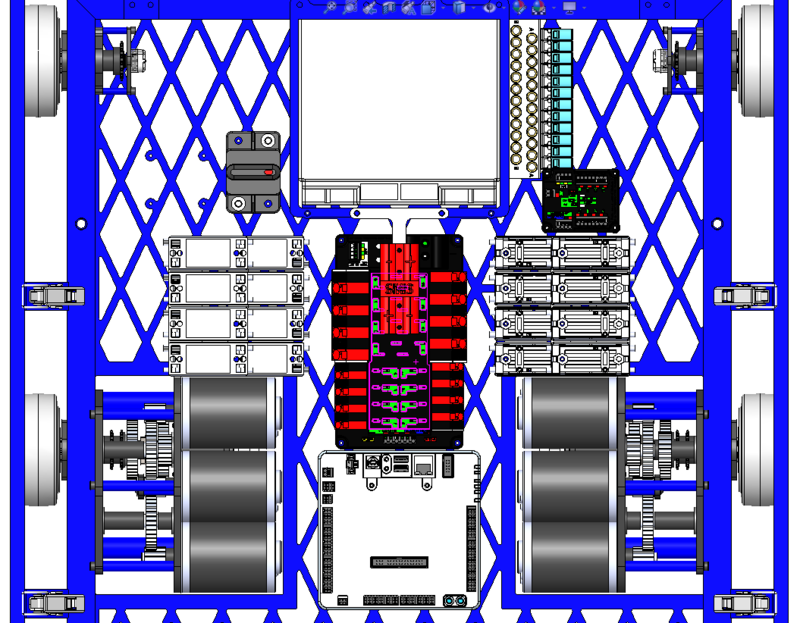 For wiring, we worked on wiring the talons and distributed power to the VRM, PCMs, and RoboRio. We completed wiring the programming bot and are close to finishing wiring the practice bot. We worked some more on the lidar driver. We discovered a few problems with the UDP method where some data would be lost when the information was sent to the roborio resulting in a few of the packets missing timestamps. To solve this problem we ended up writing to an input stream and using a buffered reader to transfer the data instead. The new method also reduces CPU usage and decreases latency, so it is pretty much better all around. The previous issue with Option B was the issue of the spool not being low enough if we directly mounted it on the shifter shaft. To address this issue, we decided to add a 1:1 reduction to lower the spool down. We also talked about the horseshoe. The horseshoe allows us to drop the intermediate stage as low as possible such that we can score our cube safely into the exchange. We also designed new bearing blocks to allow us to save an inch of space between the vertical and horizontal tube of the intermediate stage. At Wednesday's build, we worked on further detailing the forklift arm. More specifically, we added a point to the back of the arm where surgical tubing could hook onto it and in-effect spring load it downward when we are ready to climb. 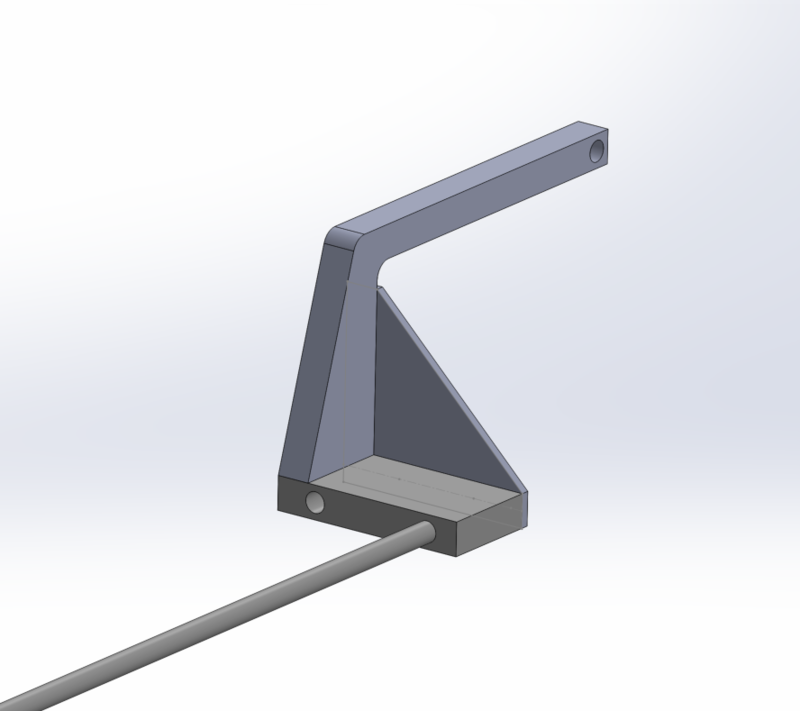 We also beefed up the main arm and added a pivot point just above the downward 90 degree angle of the arm, which will later serve as an attachment point for a tensile member that will help support the whole arm when we are lifting another robot. 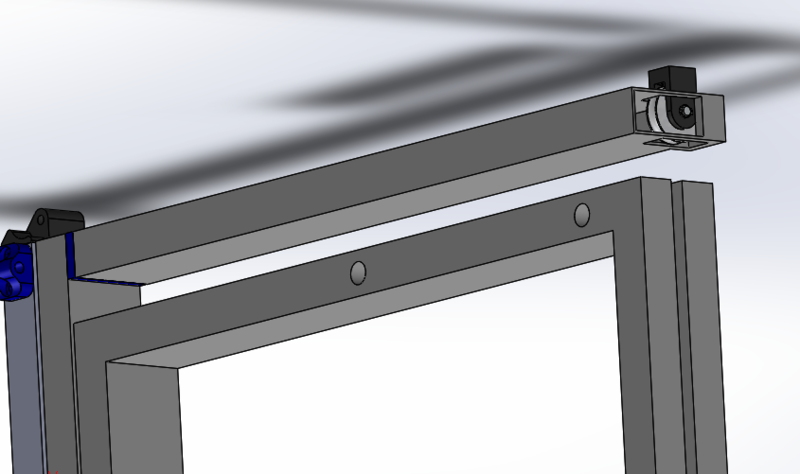 Finally, we added a small notch in the triangle brace to allow room for the elevator superstructure. 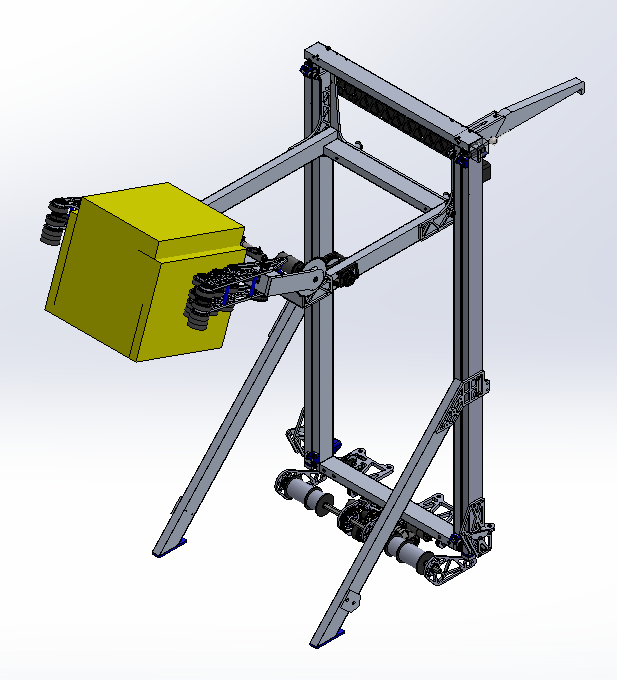 Moving forward, the plan is figure out how we will release the arm from a stowed position, and run a simulation to make sure the arm can support another whole robot. 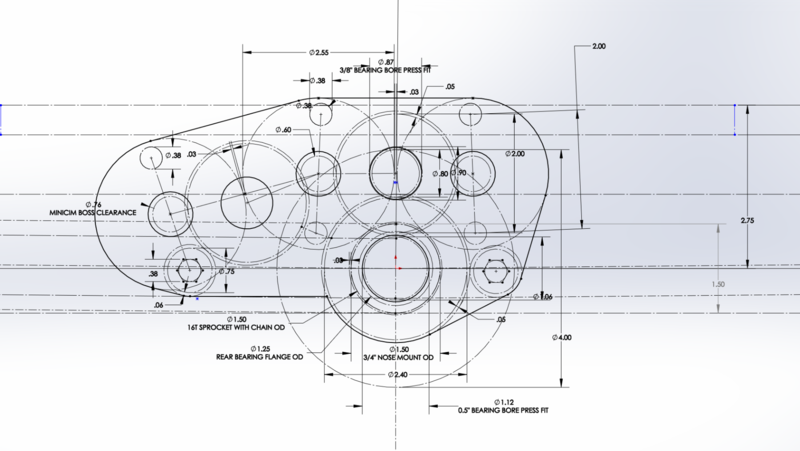 Yesterday, we decided to switch up the intake design and started designing an intake that uses several 2" compliant Andymark wheels as opposed to the 4" we had been using so far. We began designing it in cad but have not laser cut it yet. We got the RPLIDAR to output data to Network Tables, and can now access it from the node.js server. However, there are still some bugs to be fixed – for example, the data stops sending after a certain amount, and we will need to look into the problem more to find out why. Also, we will need to parse and send the data from the node.js server to the visualizer to complete the transfer of data from RPLIDAR to visualizer. 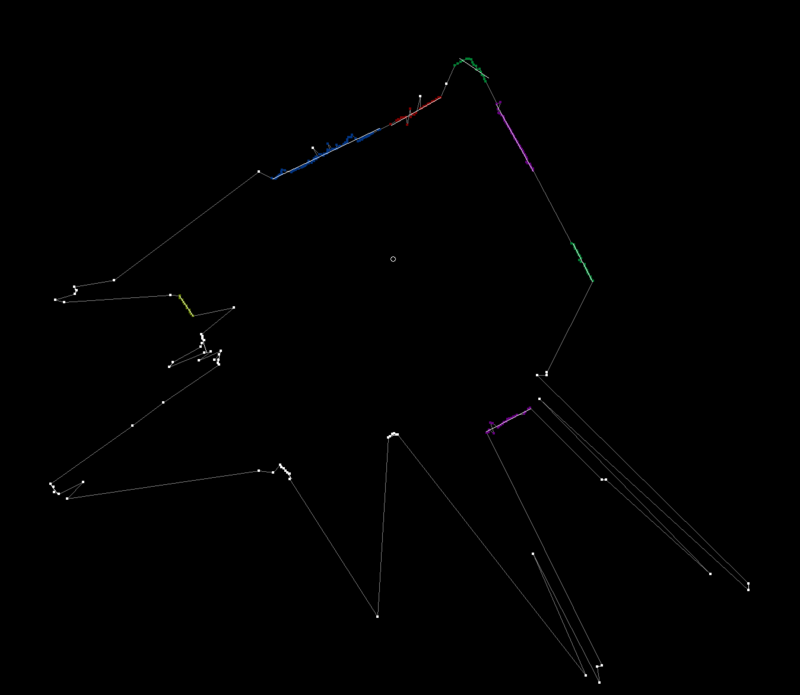 Meanwhile, we also researched more line detection methods and are working on finding the best one for our purposes. We worked on finalizing the placement of the elevator. 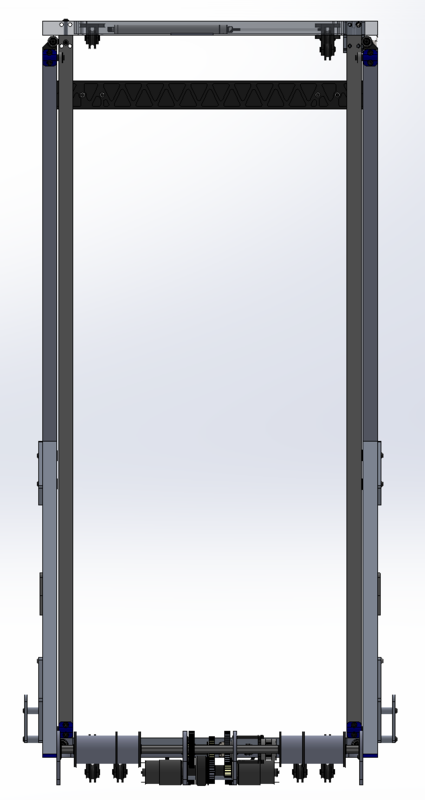 The front face of the elevator will be 9" from the outside of the back bumper. We wanted to move the elevator back because we wanted to ensure as confident a handoff between our intake which will end before the elevator and the exchange, but we also needed to leave space for the roller coaster wheels and the forklift. We decided to place a 2×2 crossbar across with 90 degree angle plugs welded in the ends to dodge the chain and mount to the elevator plugs such that the elevator and the crossbar as a whole can come off as one unit. 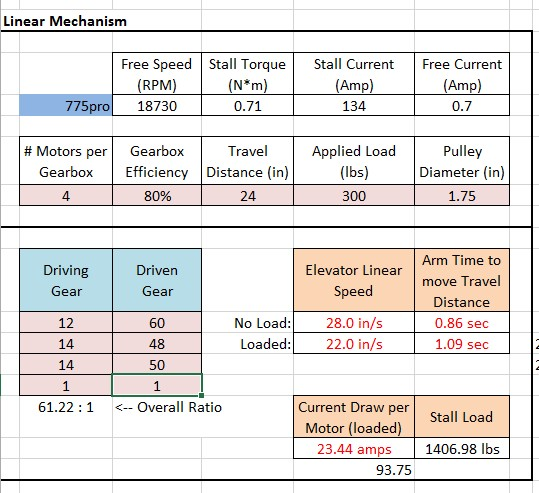 We finalized the gear reductions for the two speeds of the elevator and packaged the gearbox between the crossbar and the drive gearboxes. The gearbox will mount to the 90 degree plugs. At the last build, we worked on adding mounts for other parts of the robot to the drivebase and also placing electronics. There were a few requirements we kept in mind when placing the electronics including a horizontal battery (instead of vertical placement) to allow for a tunnel, a possible kicker roller in the front, and the gearboxes in the middle of the robot. Keeping these limitations in mind, we placed the battery in the front of the robot (to balance the center of gravity) and the PDP in the middle of the robot with stacked staggered Talons to each side. See the image for placement of everything else. 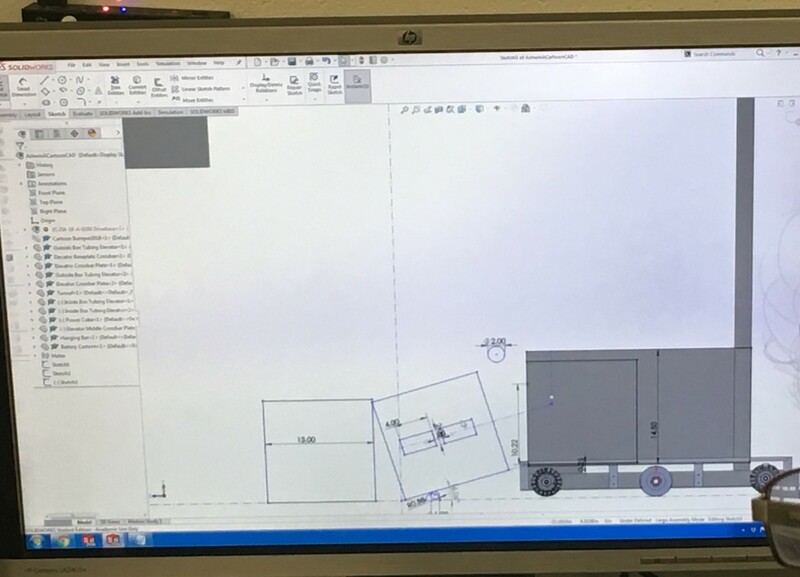 Yesterday, we worked on the Forklift design for the 2018 FRC Robot. On Friday night, we started by doing some physics calculations to determine how much the forklift would bend once a robot was on it, and determined that a 100lb force at the end of a single 36in rod we plan on using would yield a 6in deflection. This number seemed like a lot, however when we moved the 100lb force to the center of a rod (18in), the deflection was only about 3/4in, which is very reasonable. 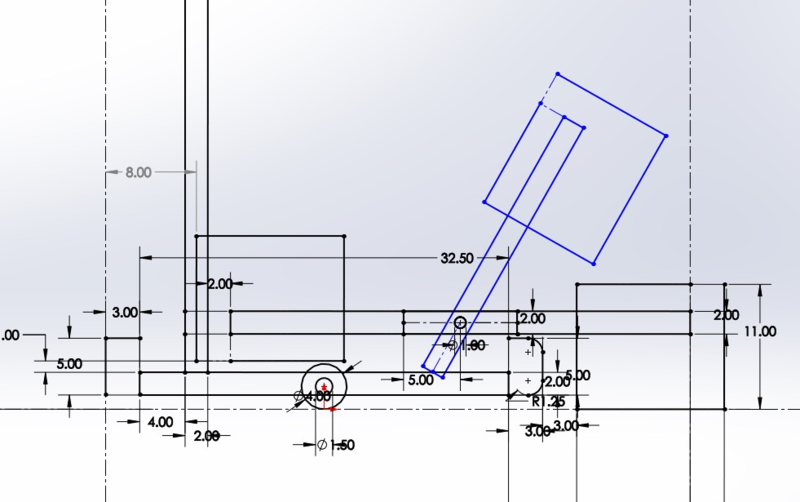 The next step was to do some sketching in CAD to figure out where the mounting place for the forklift pivot point would be. After trying to make the forklift arms fit in between the bumper cutout (which ultimately didn't leave enough space for a cube to pass through), and trying to make the arms to go over the bumper (which collided with the elevator superstructure when stowed), we finally settled on having the pivot point for the forklift mount on the elevator superstructure itself. 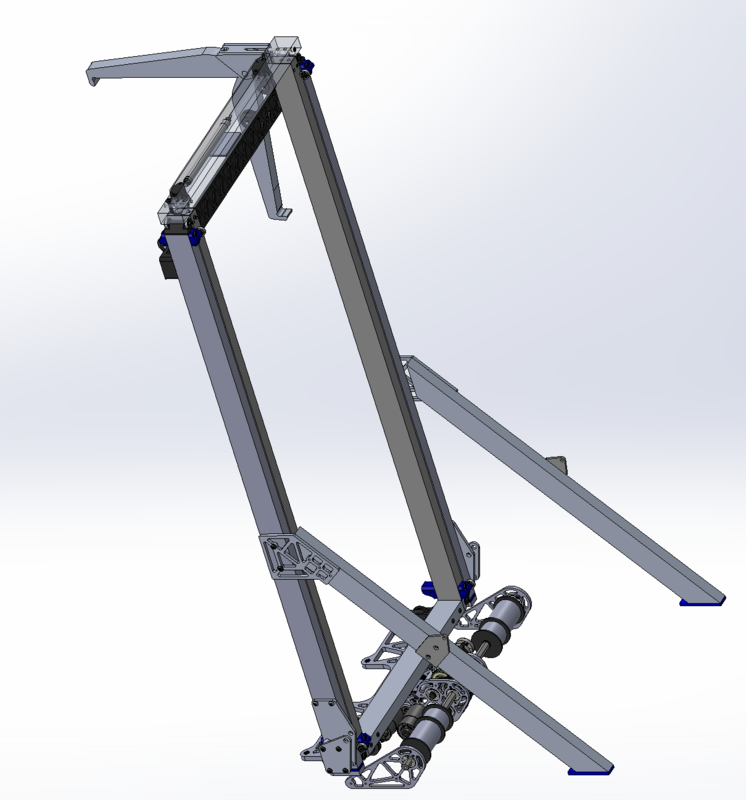 With this design, the forklift could stow vertically, and then come down neatly at the end of the match and react against the robot's frame rail when lifting a robot. 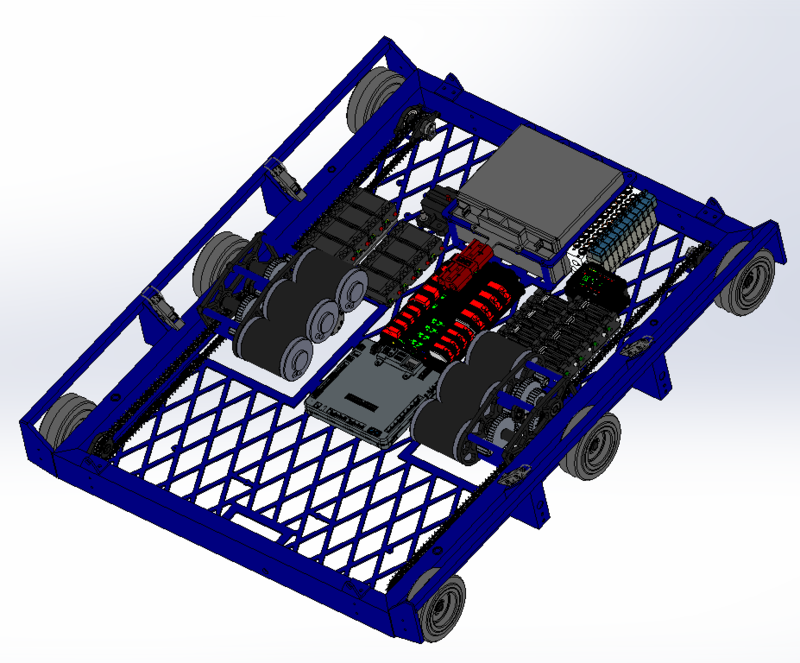 Now that we have decided to go forward with this design, the forklift design team will need to work closely with the roller-coaster wheel team to make sure that the two subsystems don't collide with one another, as they are both located in very similar parts of the robot. The intention of the rollercoaster wheels is to allow the robot to climb up straight in the sneaky hang, while preventing our partner from falling off the forklift in the partner hang. Our original plan was to have a single plate mounted to the elevator uprights, as well as a actuation deploying the wheels for both the partner hang and the sneaky hang. However, we were unable to package the plate in such a way to stow inside the frame perimeter. Thus, we decided on two separate plates and actuations for each of the rollercoaster wheels. In addition, since mounting the rollercoaster wheels on the elevator uprights would interfere with the forklift deployment, we are pursuing the deployment of the rollercoaster wheels from the bumper frame rail. We made some real progress on the RPLidar Driver using JNI. We finished most of the C++ code for the JNI, which again allows us to call functions written in other languages, in Java. To do this, we adapted some of the code from example RPLidar programs for JNI. Once we were done with the C++ code, we built the code into a Shared Object. Our next steps are to finish the Java code, which will load the Shared Object, parse the data returned, and send the data over NetworkTables to the RPLidar Visualizer. Finally, once all of the code is written, we will do some testing and debugging. We fixed an error where the RPLidar Visualizer Node.js server was unable to connect to the robot using NetworkTables, which is an implementation of a distributed "dictionary," meaning that named values are created either on the robot, driver station, or potentially an attached coprocessor, and the values are automatically distributed to all the other participants. Also, we updated some formatting on the visualizer to make the timestamp easier to read. Since the RPLidar scanner only returns an angle (in degrees) and a distance (in mm), we need to be able to transform that to XY coordinates for plotting on the RPLidar Visualizer. To do this, we had to account for the robot's own position and angle, and use some basic trigonometry to transform the vectors into coordinates. Prior to today, we had the idea of having an intake feed into a tunnel. The tunnel would serve as a conveyor system to transport the cube back and forth across the robot. However, the issues with the tunnel are that a) it will be very bulky and would serve as a huge cantilevered load on the elevator and b) the vertical translation of a cube from the ground to the tunnel (~4.75") would be hard. To solve these issues, we had a new idea where we could have an intake that would pivot 180 degrees to pick up a cube in the front of the robot and then fold back to spit it out on the back side. Since the intake is now taking in and spitting out the cube, there is no need for a vertical translation of the cube and no need for a series of rollers to convey the cube back and forth across the tunnel we need to continue investigating the geometry of this new intake design and make a decision if we want to pursue this design or not by this weekend. We have been working on using latch pieces to latch the bumpers onto the bumper rails. During our next build, we will decide if this is the best way to go and finalize the bumper mounts on the drive frame rails. With our new intake prototype design, the intake is mounted on an arm and grips the cube. The arm that the intake is attached to has the ability to rotate back 180 degrees. 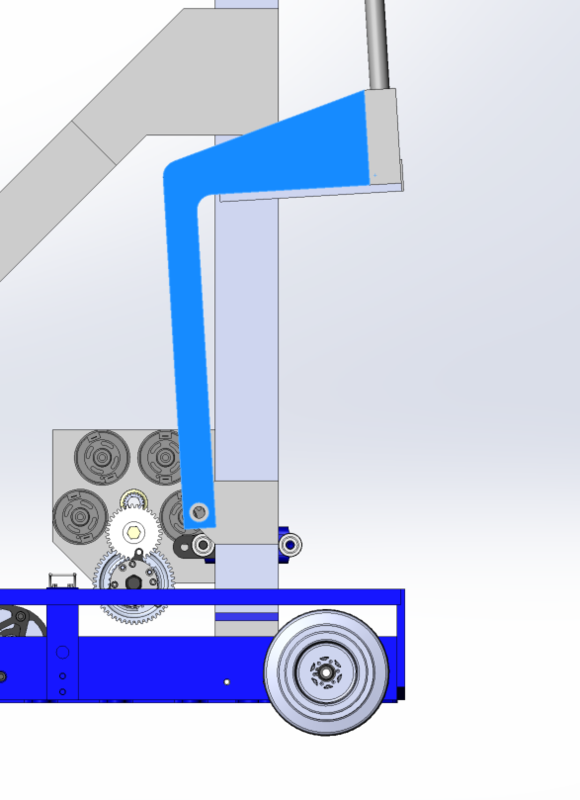 We plan to have the arm and the intake system itself mounted onto the elevator. When the elevator moves up, the intake arm rotate back and ejects the cube onto the scale or switch. A few issues we are facing and trying to solve, are that we don’t want the intake to be too heavy and we want the intake to have a better grip on the cube. 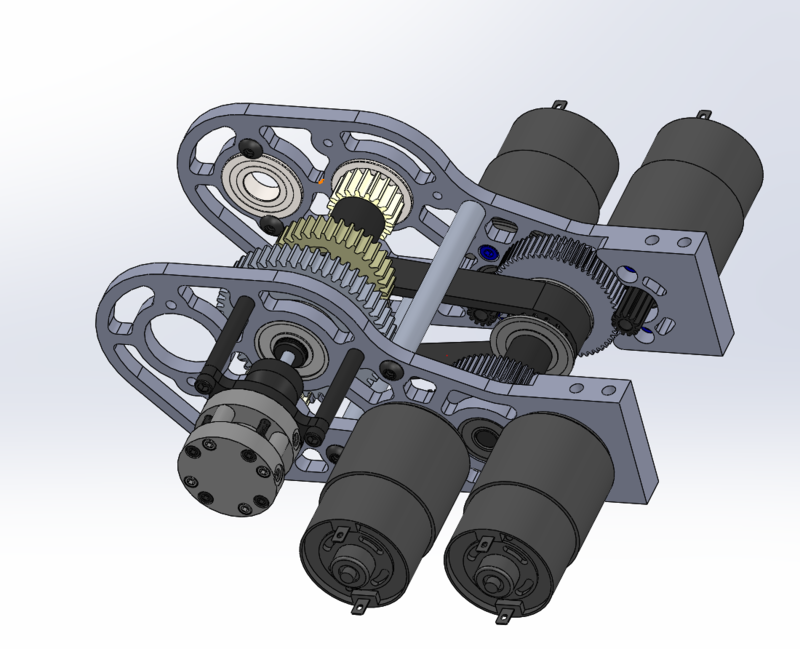 We found out today that the gearbox will have to be redesigned. Our original plan consisted of a triangle of mini-CIMs but this design was too tall and would not allow the tunnel to lay flat and exhaust cubes to the exchange. Our new design still uses 3 mini-CIMs but they are arranged flat so that they can be lower than the bumper rails. For the tunnel, we worked on prototyping a mechanism that used timing belts to move the cube.. We made a four bar that allowed us to test the cube in both orientations (11 and 13 in width). Initially, we had trouble with the prototype as there was too much friction between the wood the cube rested on and not enough tension in the belt. 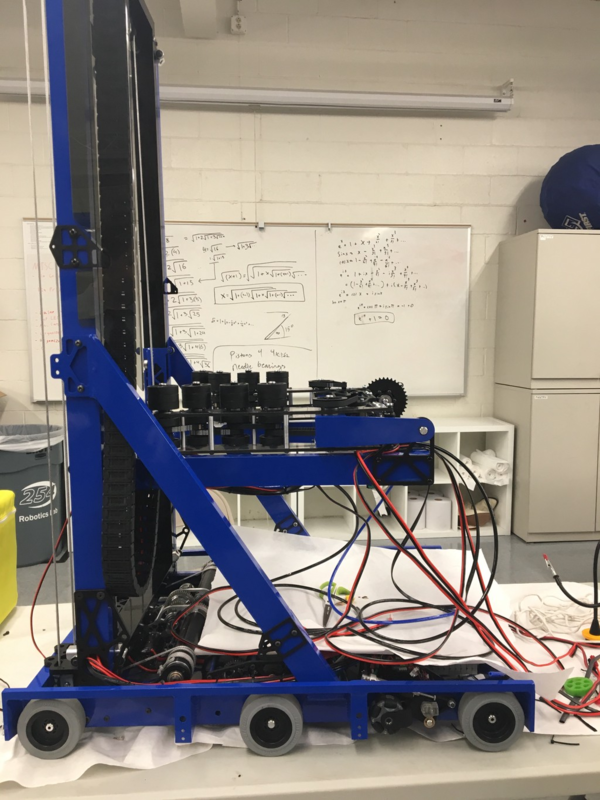 We redesigned the prototype and made changes including making the four bar structure more secure, tensioning the timing belt, and installing plastic rails for the cube to slide on. These changes greatly increased the effectiveness of the prototype, and pushed the cube quickly through the tunnel. We now are designing a variation of this but using rollers instead of timing belts, to see which one works better. After ensuring that the RPLIDAR works, we discussed several options, and have started to implement two of them. For our first method, we were able to use existing examples of code, from the RPLIDAR’s Software Development Kit (SDK), and write our own program that gets data and a timestamp for that data from the RPLIDAR, and send that data to the robot. Because the SDK is for C++, we would probably have to run this program on a co-processor on the roboRIO that communicates with the rest of the robot code over User Datagram Protocol (UDP). Our other option, which is more preferable, is to use the Java Native Interface (JNI). JNI allows the Java Virtual Machine, which runs Java code, to call functions written in other languages, which will allow us to use the SDK, even though it is written in C++. We will continue work on both of these methods, and choose whichever will work better for the robot. To ensure we have a stable robot when our CG raises with our elevator, we decided to extend our wheelbase as far out as possible. By doing so though, we are more susceptible to high centering on the platform ramp. To ensure we do not do so, we revisited the sketch we used to model the drivebase motion and adjusted the parameters to space the wheels as far out as possible and with a center drop. We also decided to constrain the lowest height of the bearing holes by having the center 16 tooth sprocket with chain OD be tangent to the baseplate. We will account for the chain run by having a cutout in our base plate. 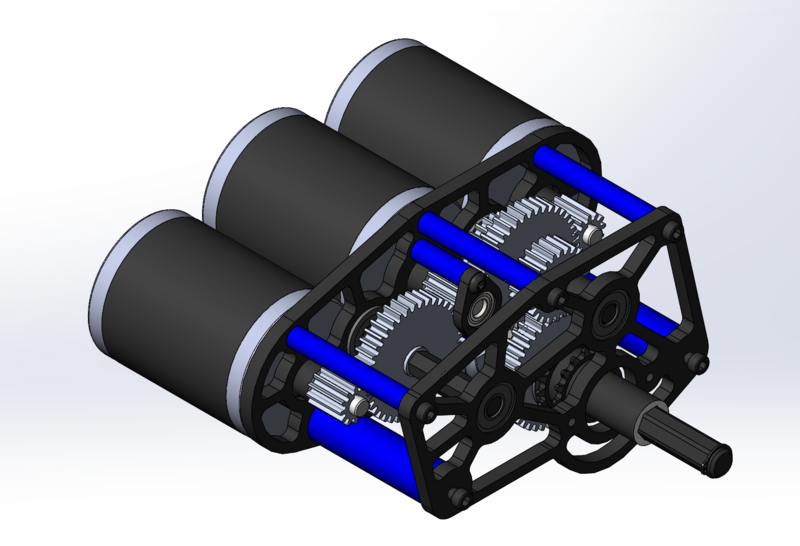 We finalized the design of the drive gearbox and placed an order for the necessary hardware required (gears, pneumatics, screws, etc.) 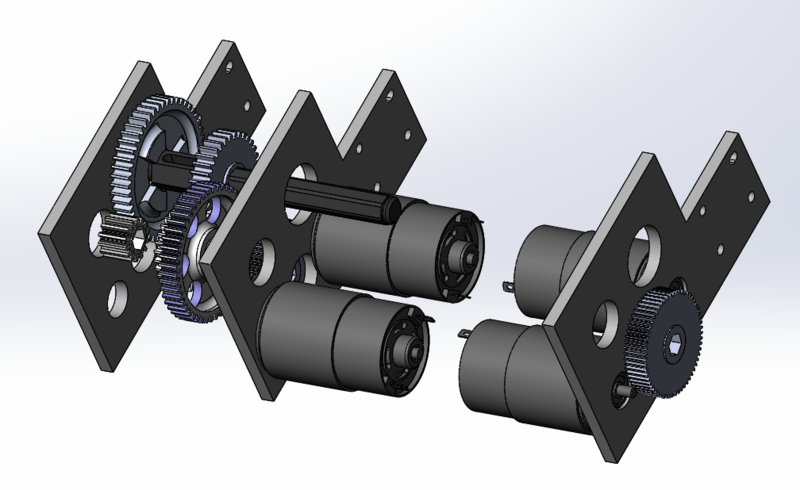 We hope to begin assembly of the drive gearbox this week. We sketched the electronics placement on the baseplate. 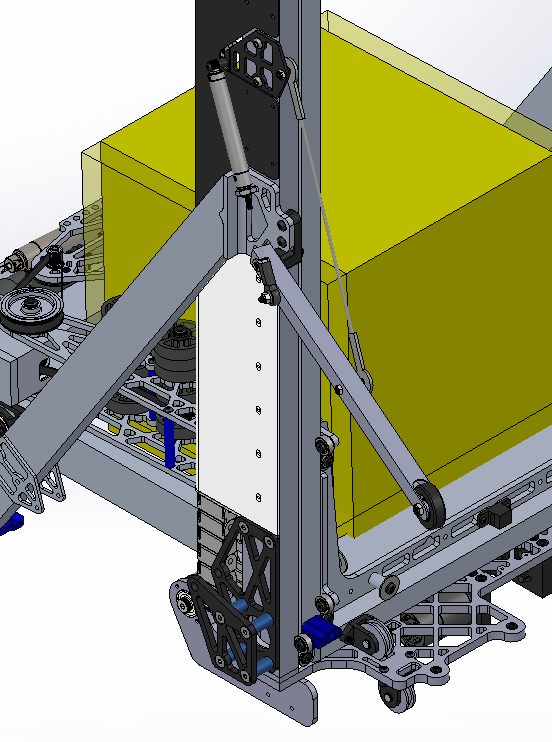 We plan on having the battery lay flat as in 2017 rather than standing up as in our 2016 robot. This way, we can lower the carriage/tunnel as far down as possible which means the cube does not need to move vertically as much from the ground to the handling mechanism. We assembled an intake with adjustable wheel placement and pivotable arms/outer wheels, and mounted it to the 2017 drivebase. We controlled each wheel with its own independent 775pro geared with a 5:1 reduction —- by doing so, we were able to test asymmetry and easily adjust certain speeds of certain wheels. This intake prototype worked well in quickly drawing in the cube and orienting it from a diamond to a square shape. 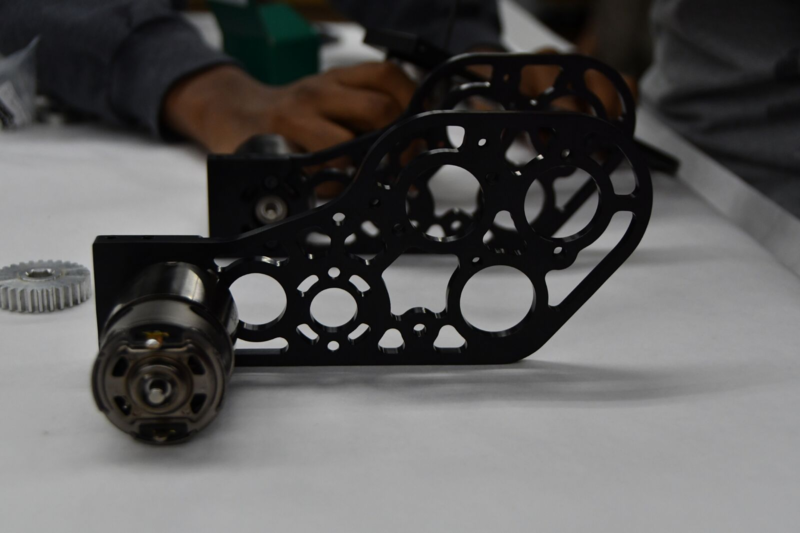 We also saw that by increasing the pressure in the pistons controlling the outer arm pivot, the intake itself became a lot stiffer and was able to better control the cube. We quickly implemented a bottom kicker roller and saw that it worked well because the intake itself was able to provide enough force to push the cube up and above the kicker roller. Moving forward, we will design a prototype that combines this intake with a kicker roller and mount it on a test drivebase. 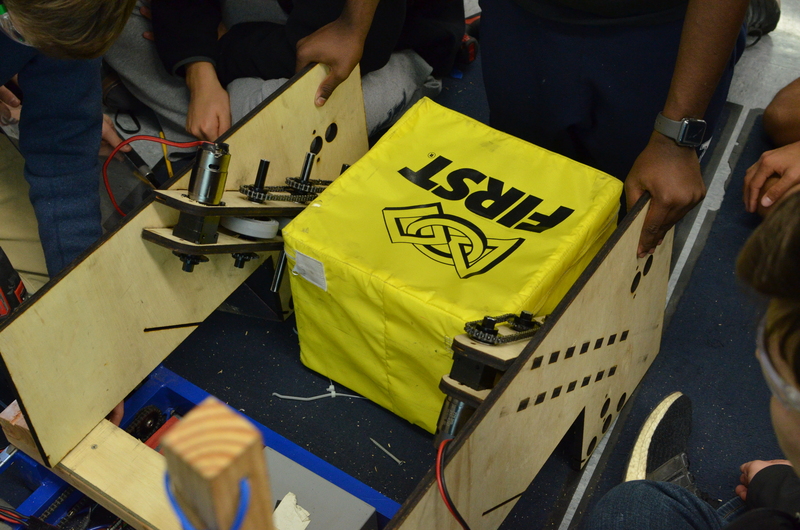 We design and tested if a kicker roller + a ramp with wheels on either side guiding the cube up would work in transitioning the cube from the ground to the tunnel. While testing, we realized that the wheels on either side did not grip well to the cube (we used colsons) and the transition from the kicker roller to the ramp and wheels was not as straightforward as expected. 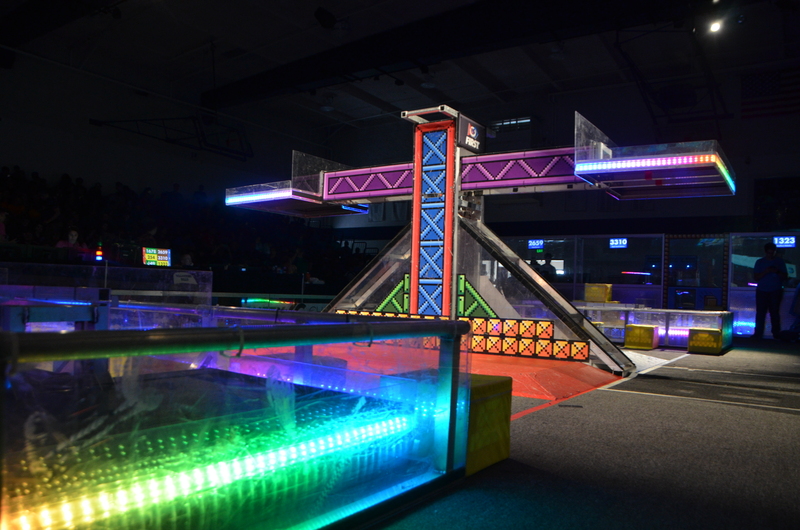 When the cube goes over the kicker roller, its motion is not very controllable especially when that is the only roller it is contacting. We added a vertical constraint (a piece of 2×4) to stop the cube from being kicked too high, however it deflected the cube from the center of the intake and away from the ramp. Watch this video to see the prototype in action. Today was mostly filled with discussion regarding how best to integrate the various systems of the robot and how to constraint the placement of those systems. 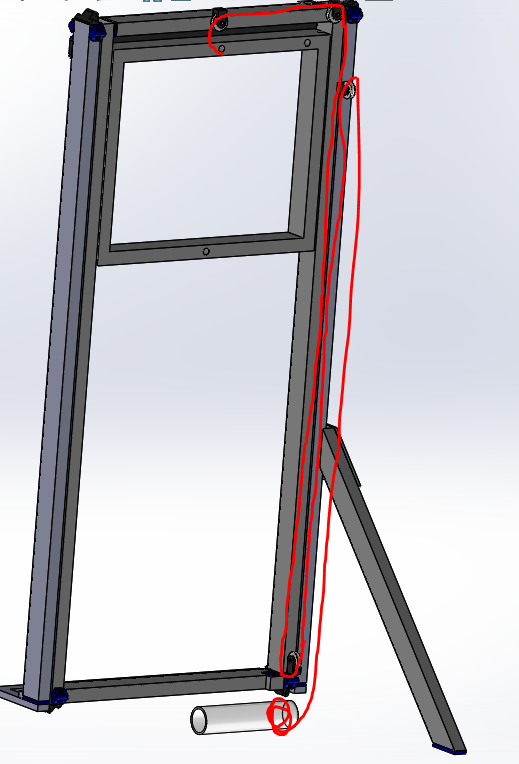 In terms of the elevator, we will be moving the outer bars (2×1 box tubing) to sit on top of the frame rails. The outside face of the intermediate stage will come in 0.138" (same clearance used in 2011) from the inside face of the outer bars, and then the carriage tunnel will be another 0.138" in from the inside face of the intermediate stage. This leaves us with around 17" for the width of the tunnel which we think will be enough to handle any orientation of the cube. We also investigated the elevator placement with regards to climbing. To make climbing especially easy on the drivers, we plan on driving straight up onto the ramp and having our bumpers flush against the scale wall and our elevator bar flush against the 2×2 box hanger box tubing. With those constraints, this means our elevator sits 8" from the outside face of our bumper which also means that given we want to spit cubes out on the back side of the tunnel (the side opposite the intake), we need to spit them 8"+. 8"+ is not ideal especially if we want to strategically place a cube, so we need to further investigate how best to optimize elevator placement. We also did line contact calculations on the bearings contacting the intermediate stage from the outside bar, and given that we are hanging 3 robots, then the bearings as well as the aluminum tubing will endure more load than their static load capacity and yield strength, respectively, can handle, To solve this, we tossed around ideas of alleviating a portion of the load from the bearings with a tensile member extending from the top of the intermediate stage to the CG of our robot (the tension of the cable acts opposite to the torque of the robots). 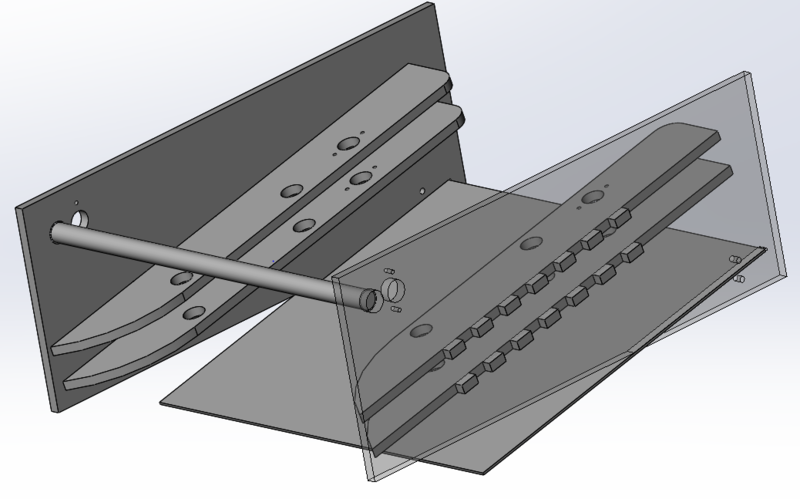 Lastly, we decided that to ensure we have a smooth transition from the intake to the tunnel, we will have the intake fixed to the tunnel and not pivot, but will have the entire tunnel + intake system pivot such that it can stow within the frame perimeter, intake horizontally, and place cubes on stacks on the scale. We tested the driver that was already written, but nothing happened. After rewriting some of the code, we were able to send a request to the RPLidar and received some sort of "ok" response, but still, the RPLidar did not start scanning. 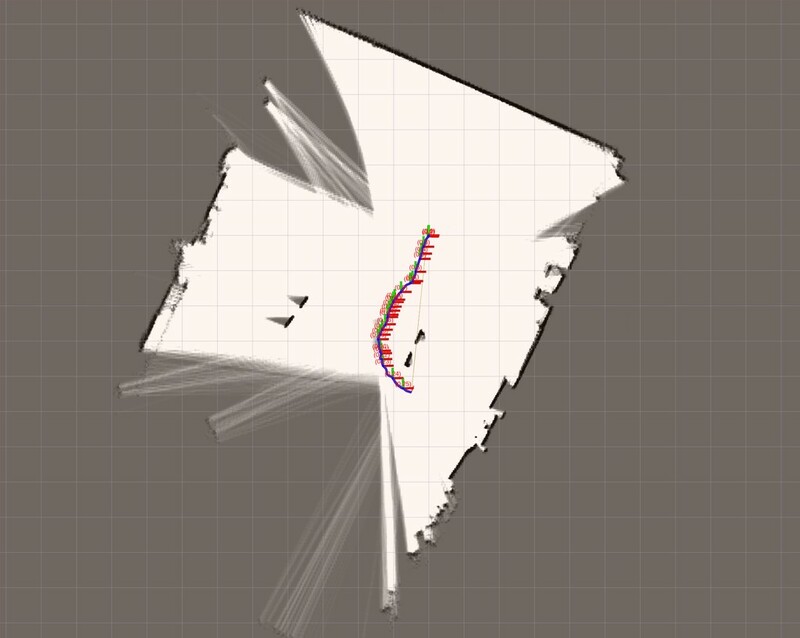 We worked on some more modifications to the visualizer. We were able to cache all the data sent to the visualizer in an array, so that we could view data with specific timestamps. We also worked on being able to zoom in and pan around the image of the field, so that it is easier to see, but there are still some bugs with this. For testing purposes, we remapped the control board so we could toggle each of the four motors on the intake prototype with four separate buttons on the driver station. We also added some buttons to change the speed of the motors on the intake. In addition, we read the drive code, but since last year's programming bot did not have a working compressor for the dog shifters on the drivebase, the robot could not drive.